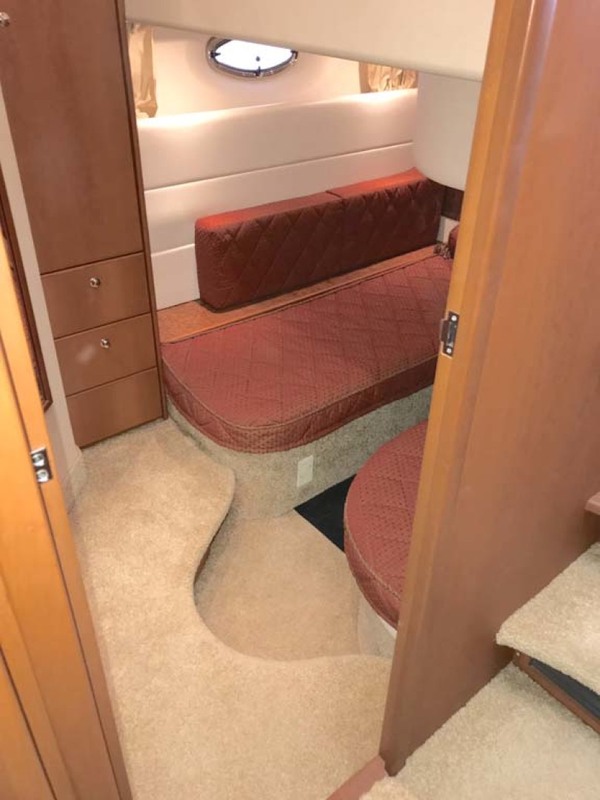 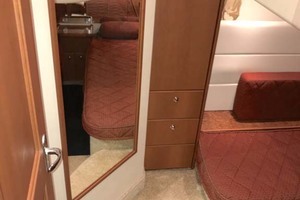 Owner is Moving to a Land-Yacht....Submit All Offers!! 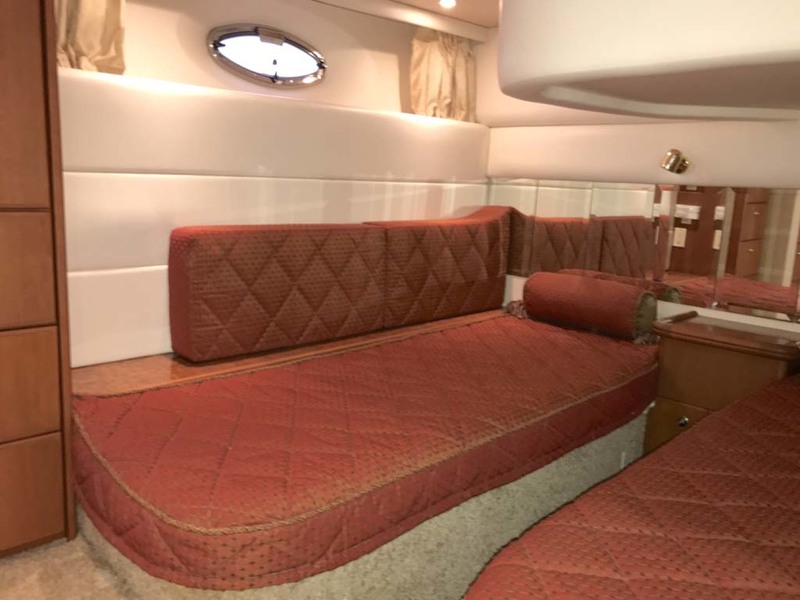 This cruiser is absolutely immaculate! 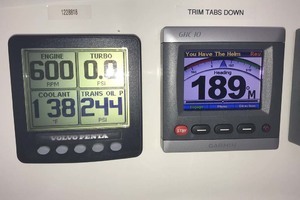 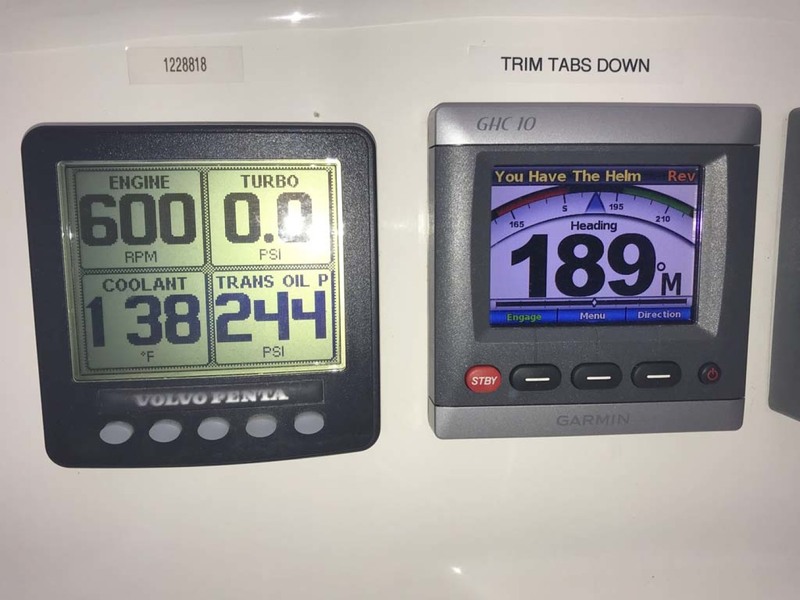 Powered by 740HP of Volvo diesels with approximately 600 hours and newly rebuilt IPS transmissions (joystick control for easy dockage). 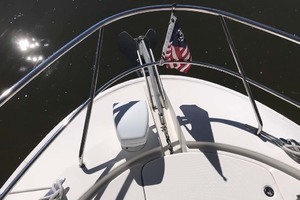 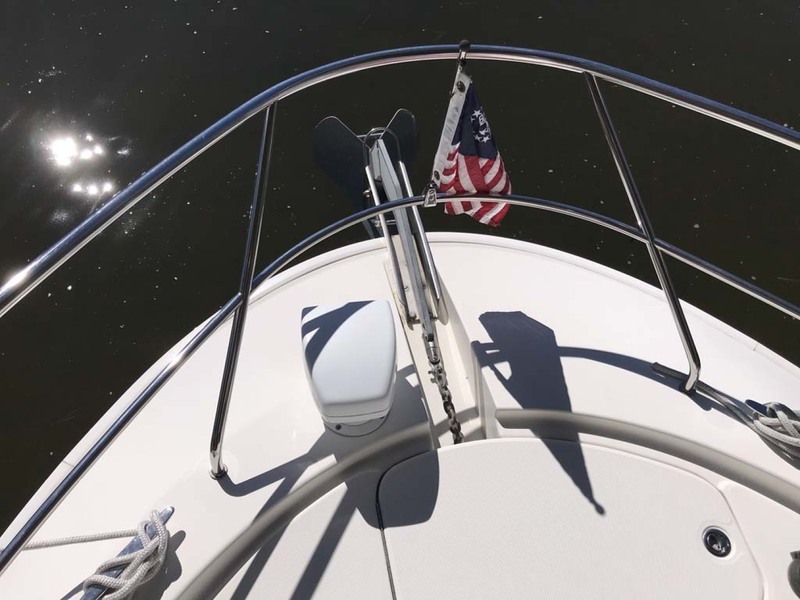 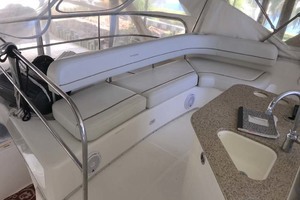 The most prominent feature of the 43 Sport Bridge is her spaciousness, both above and below deck! 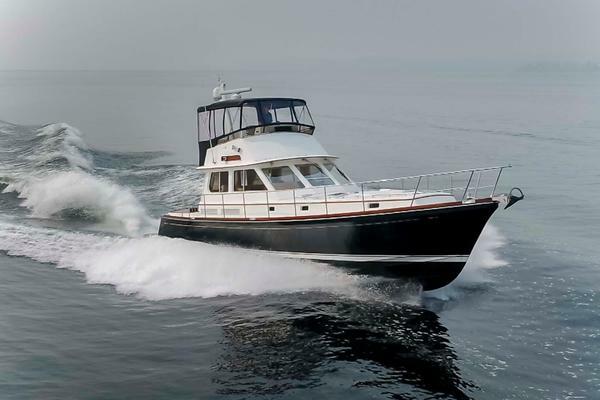 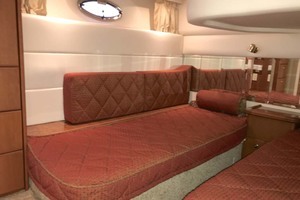 She boasts one of the largest flybridges of any boat in her class. 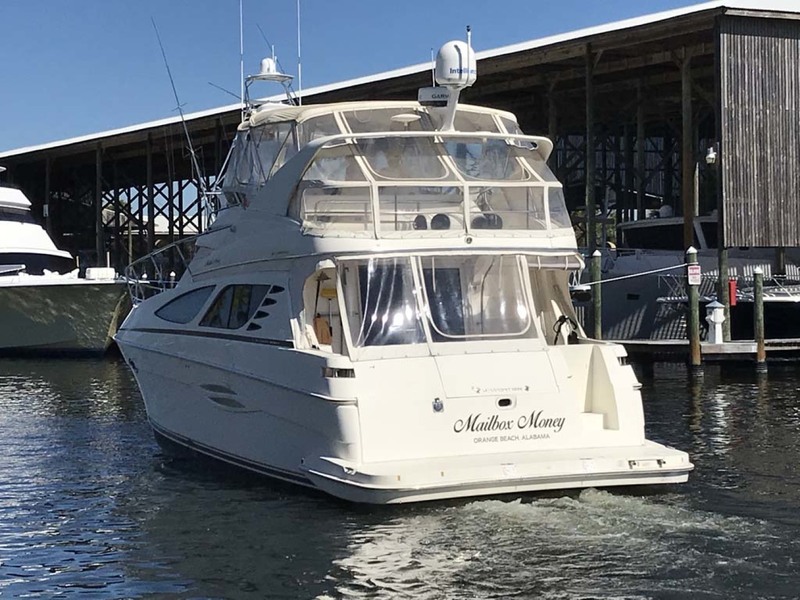 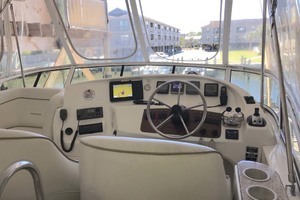 With her ample seating and wide foredeck, the spacious bridge provides all the room and comfort you will need to cruise and entertain in style. 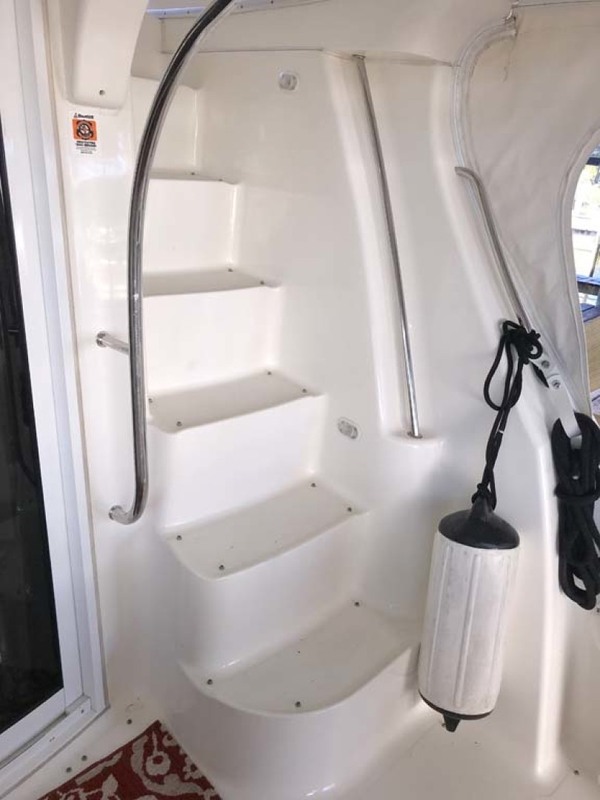 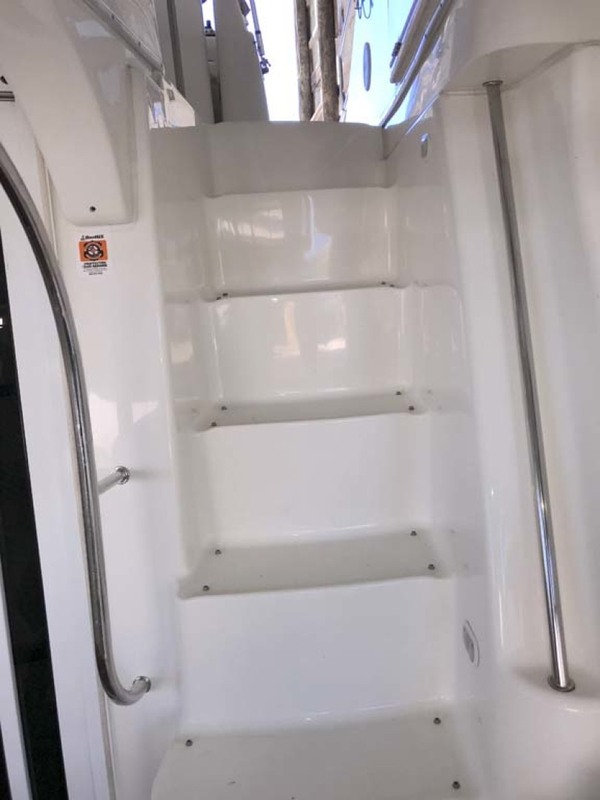 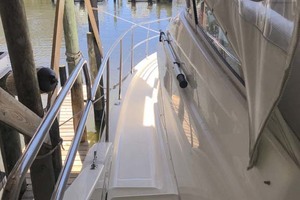 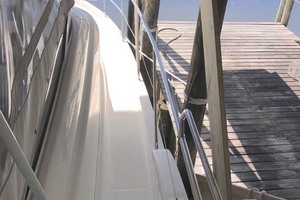 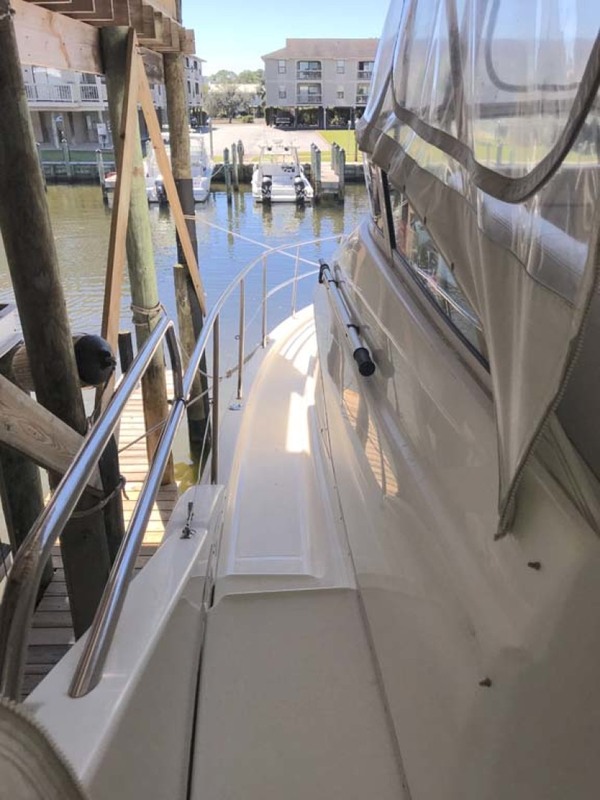 Silverton's sidewalk and a unique set of molded steps connecting the bridge to the foredeck makes access between the two both safe and convenient whether you're underway, anchored, or handling lines. 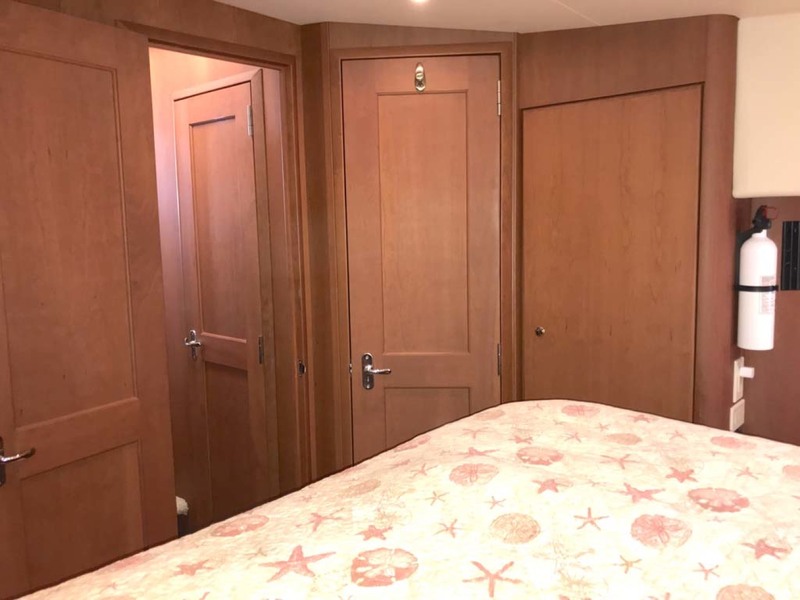 Inside you will discover two private staterooms and two full heads with standup shower, complimented by a plush salon finished in fine cherry wood and a full-amenity galley. 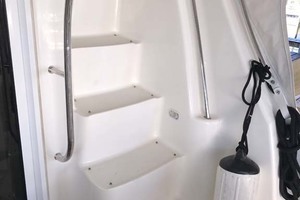 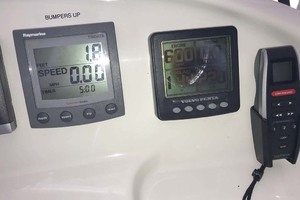 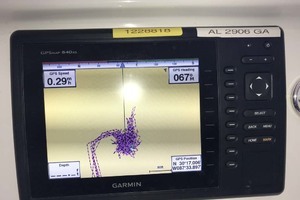 Further, an extended swim platform is integral to the hull and has ample room for stowing the tender and outboard motor (included). 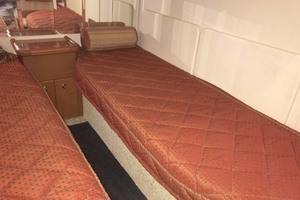 Sleeps up to 6 comfortably!!!! 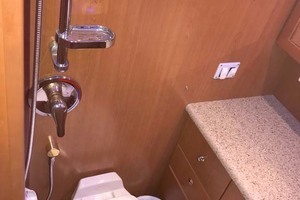 Two Heads with Showers!!! 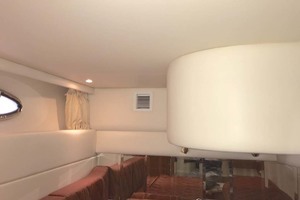 Spacious Salon, Raised Dinette with Seating for 5, Great Views!! 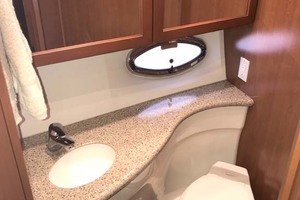 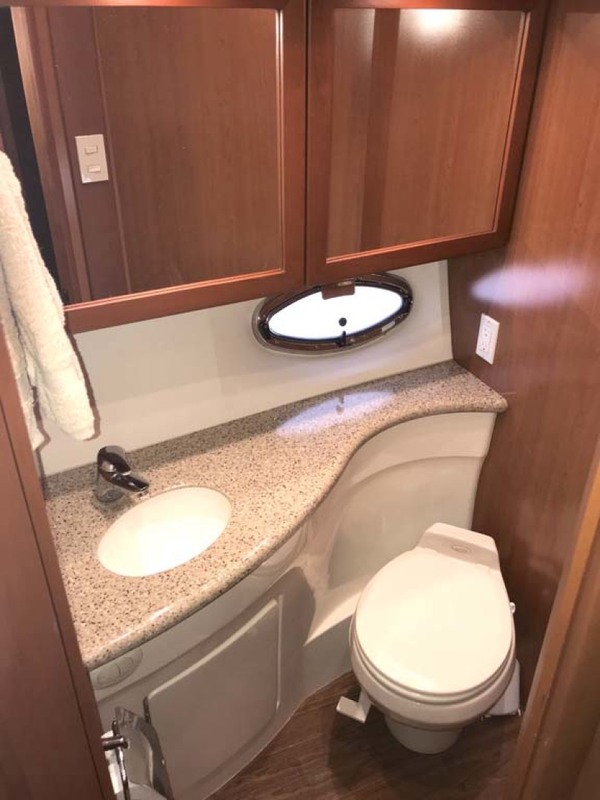 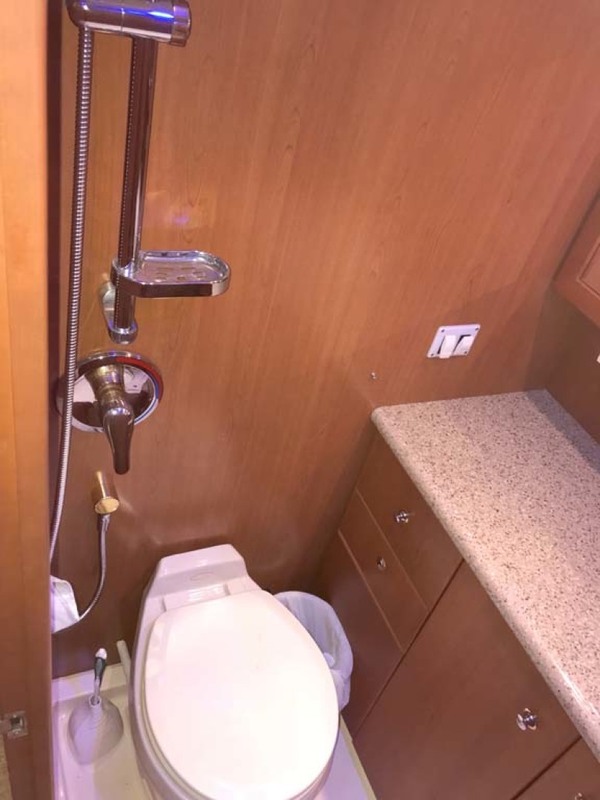 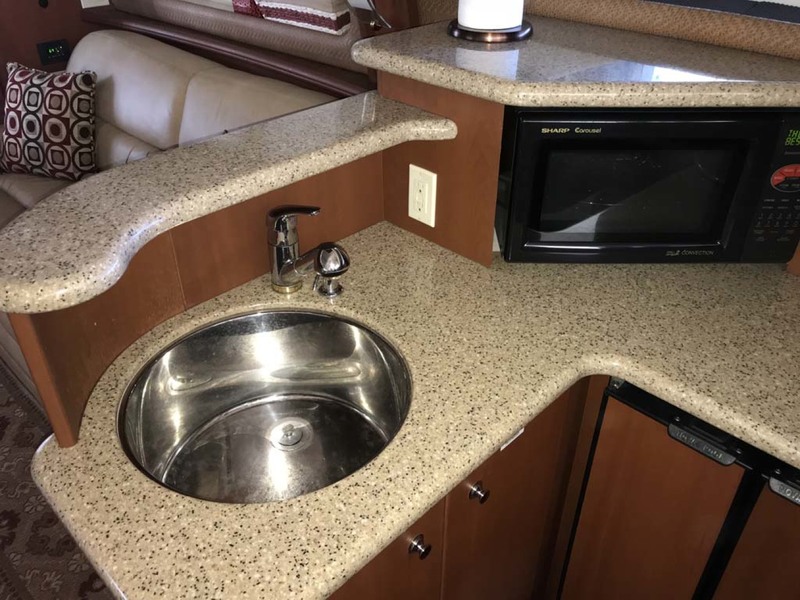 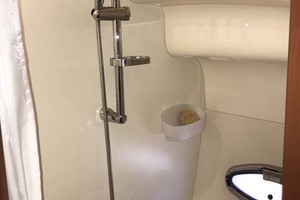 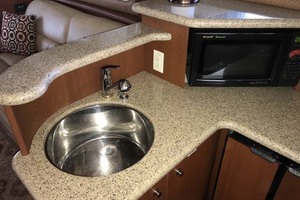 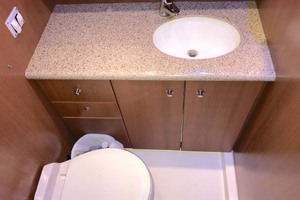 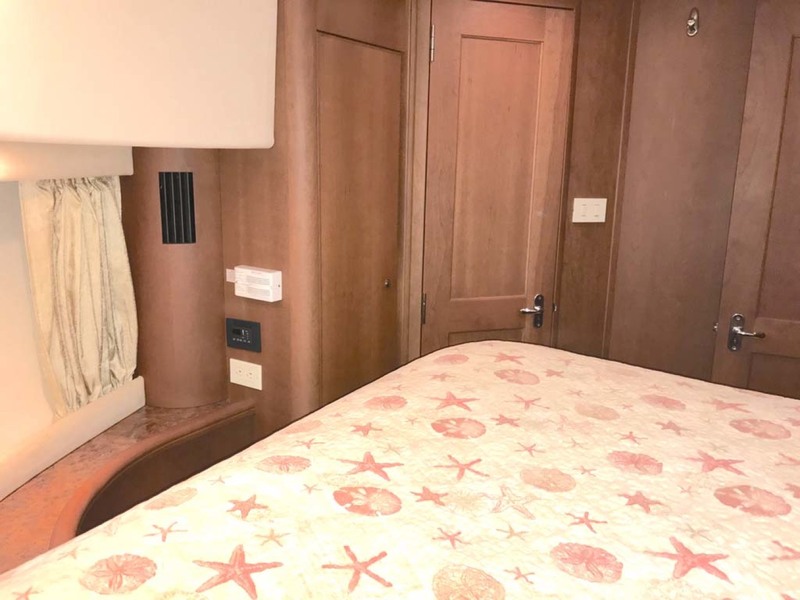 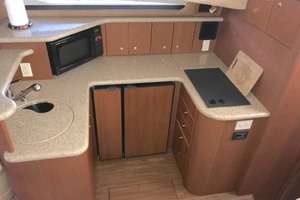 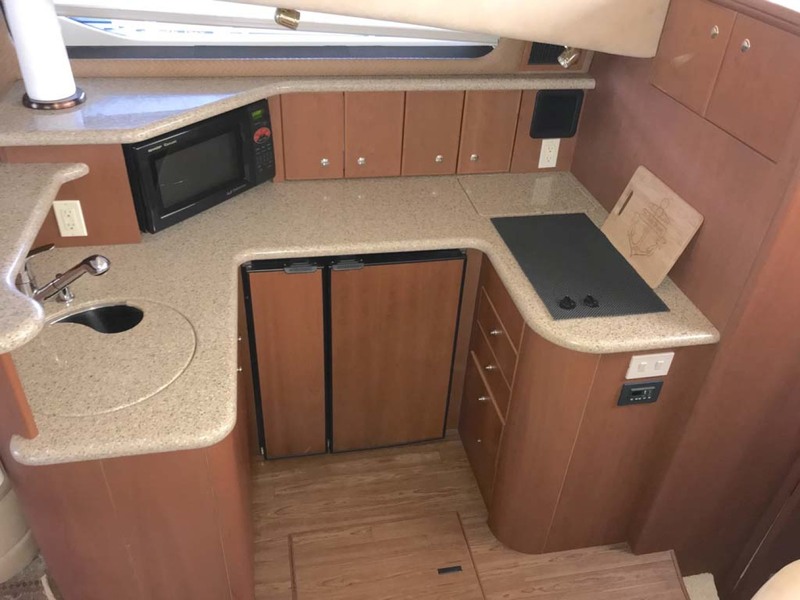 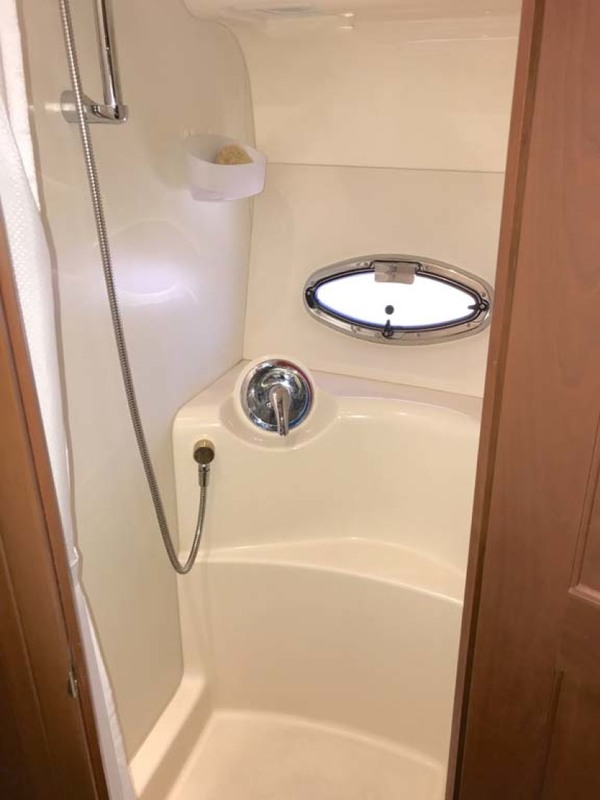 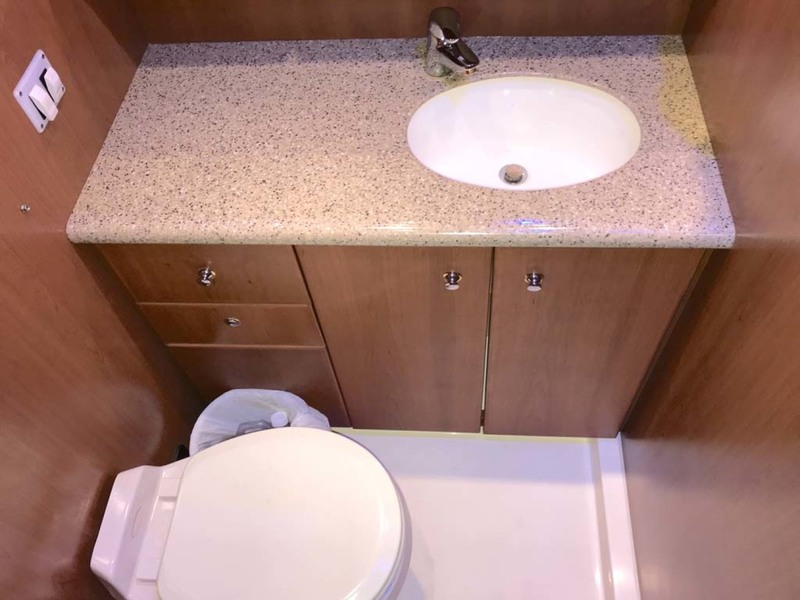 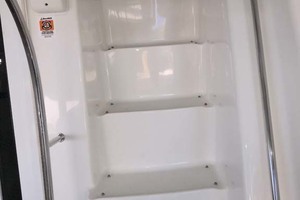 The spacious U-Shaped galley is situated forward on the port side that includes a side-by-side refrigerator, roomy countertops, low-maintenance flooring, and plenty of stowage including an undersole bin for stashing dry goods and, a large stainless steel sink. 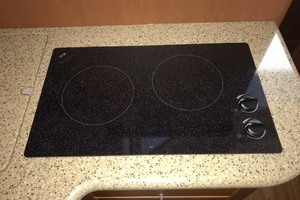 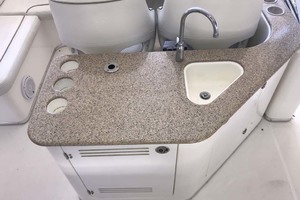 This sink is large enough to really be useful (pasta pot or can wash a large cutting board etc). 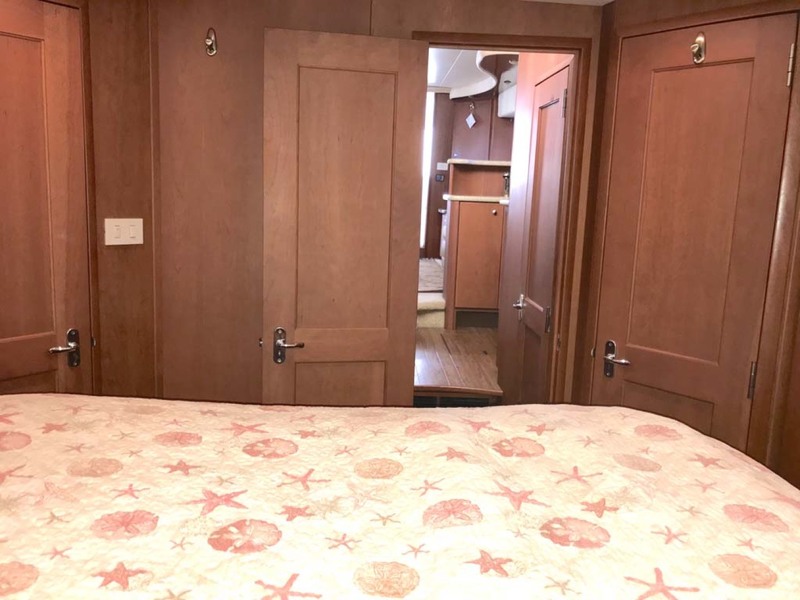 Opposite the galley to starboard is a dinette with a handsome cherry table ringed with seating for 5. 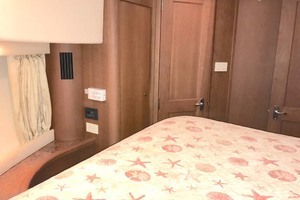 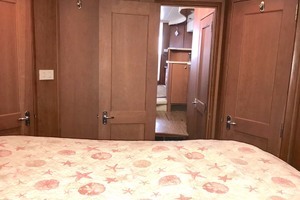 Forward, the master stateroom offers a queen-size berth with innerspring mattress along with port and starboard hanging lockers. 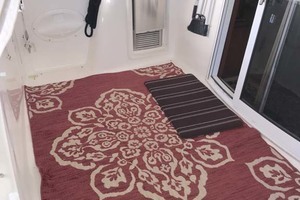 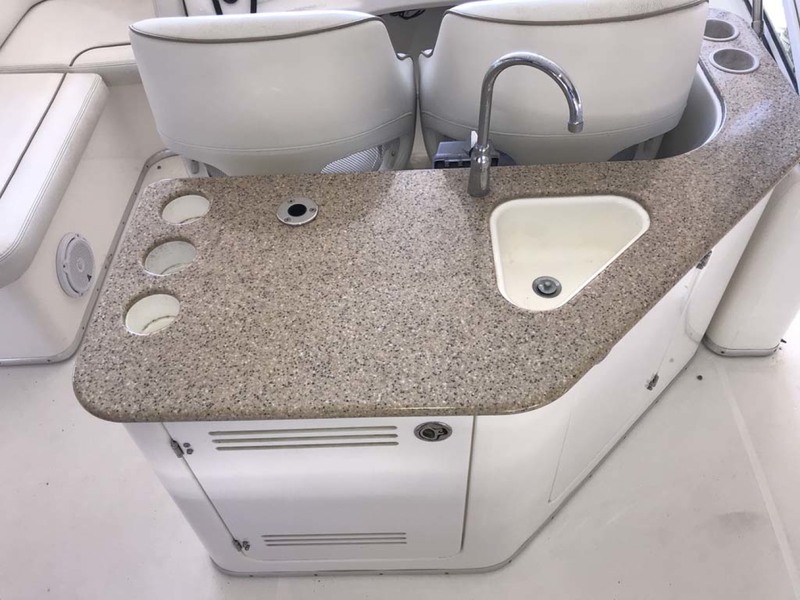 A noteworthy feature is the split-head arrangement allowing one person to shower while the other has unimpeded use of the sink. 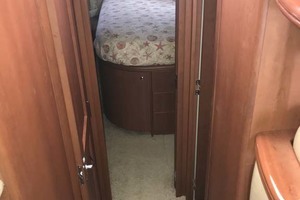 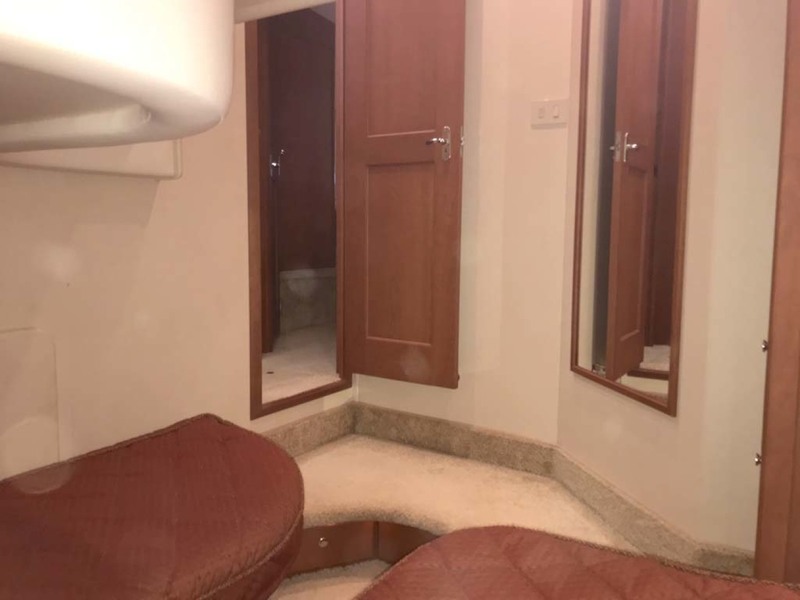 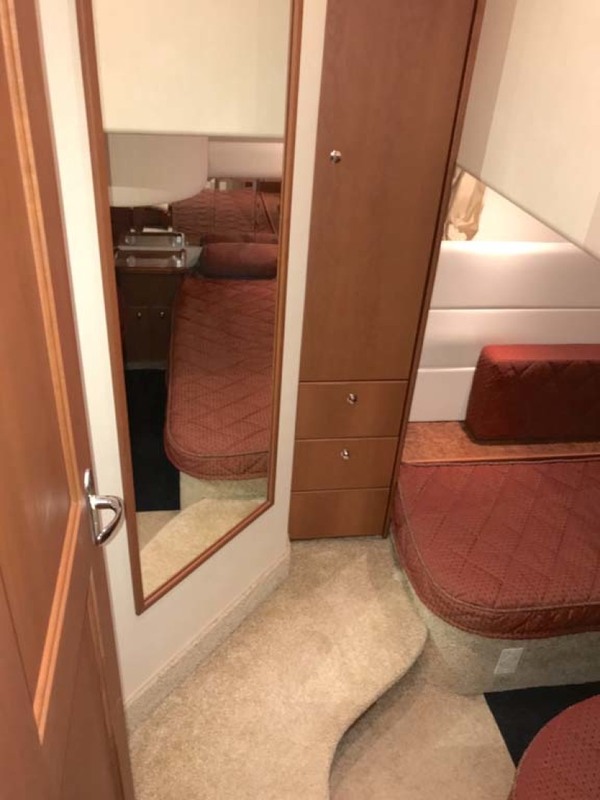 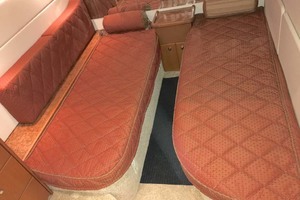 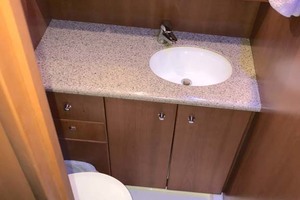 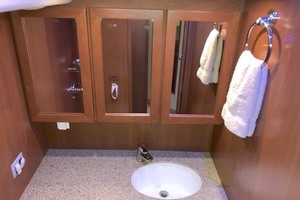 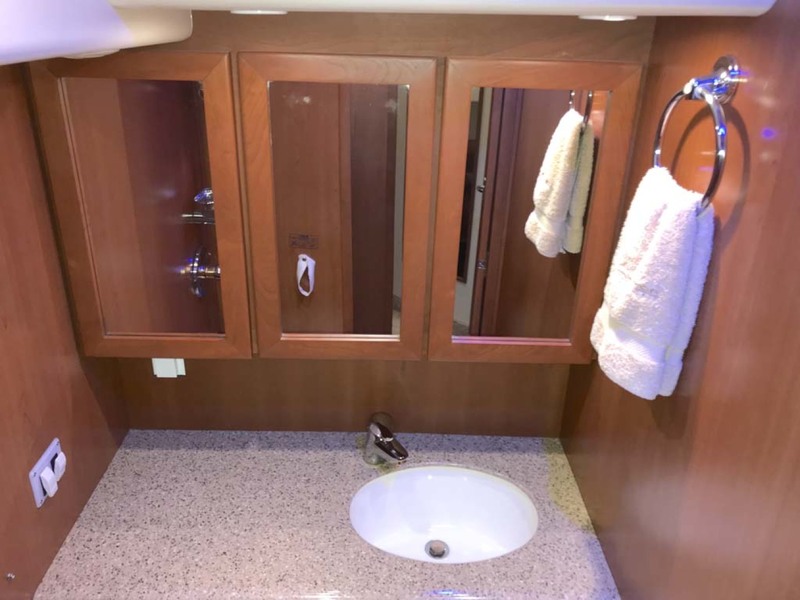 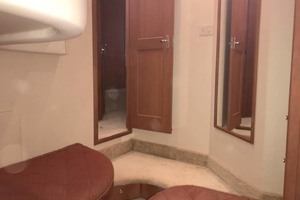 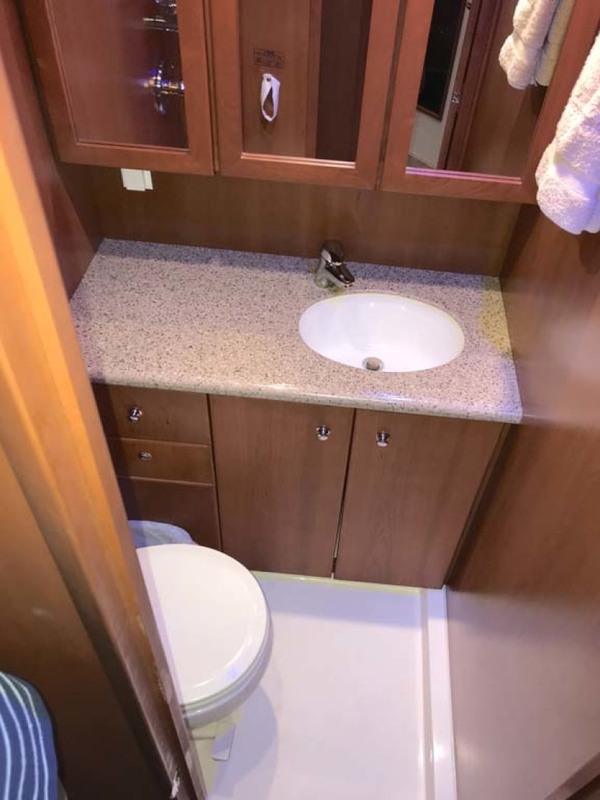 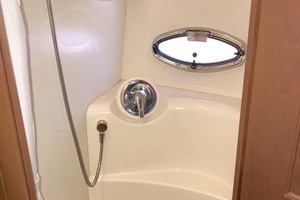 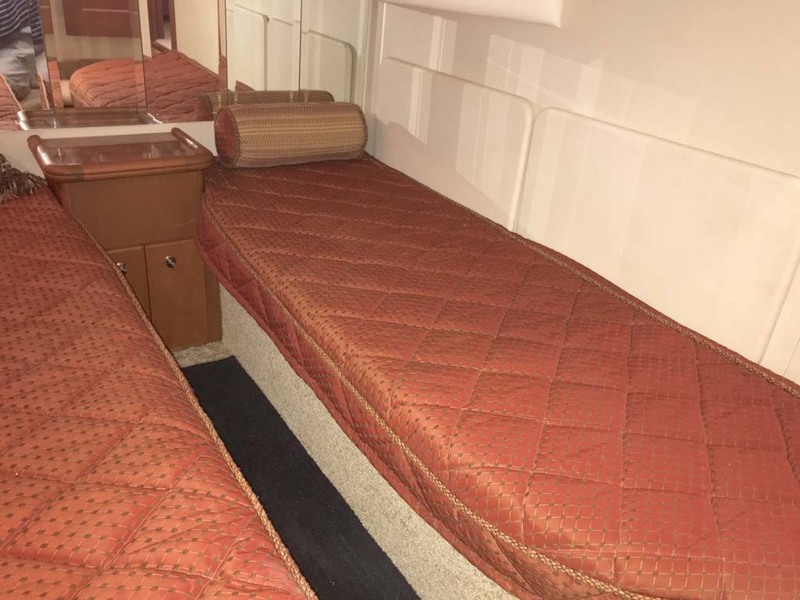 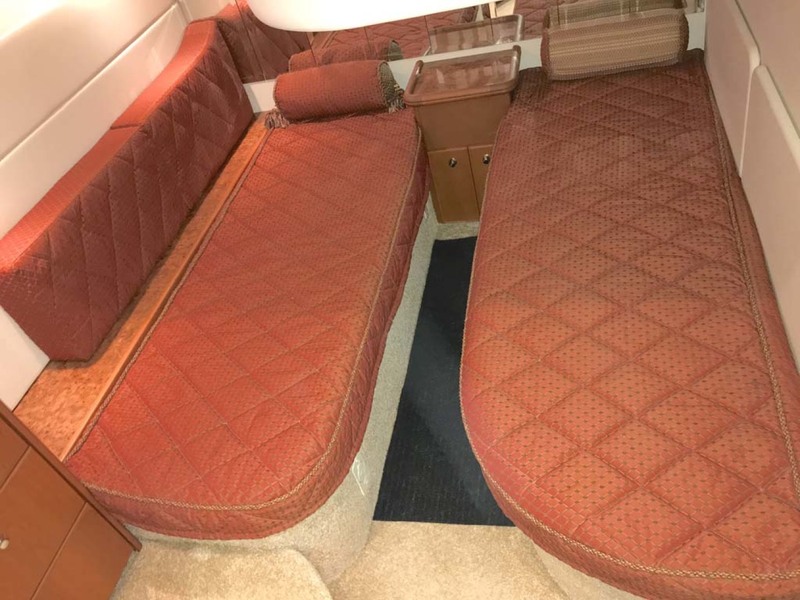 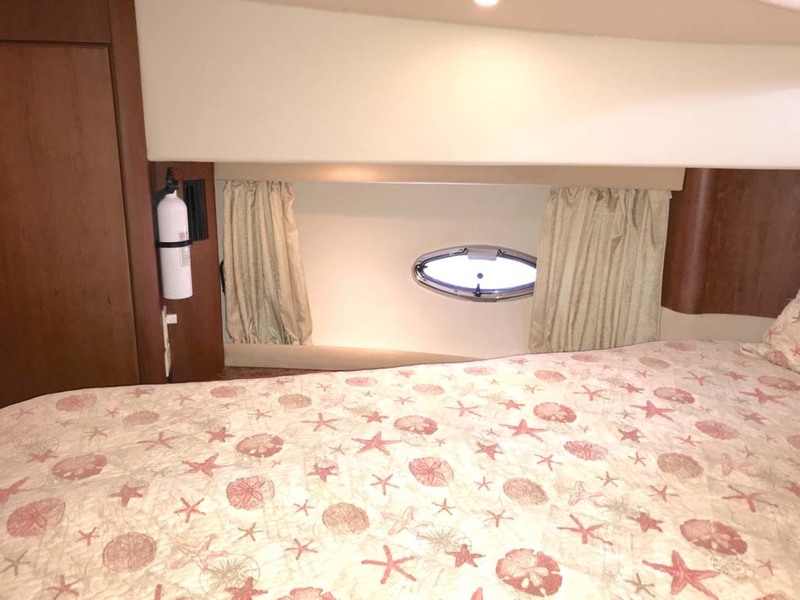 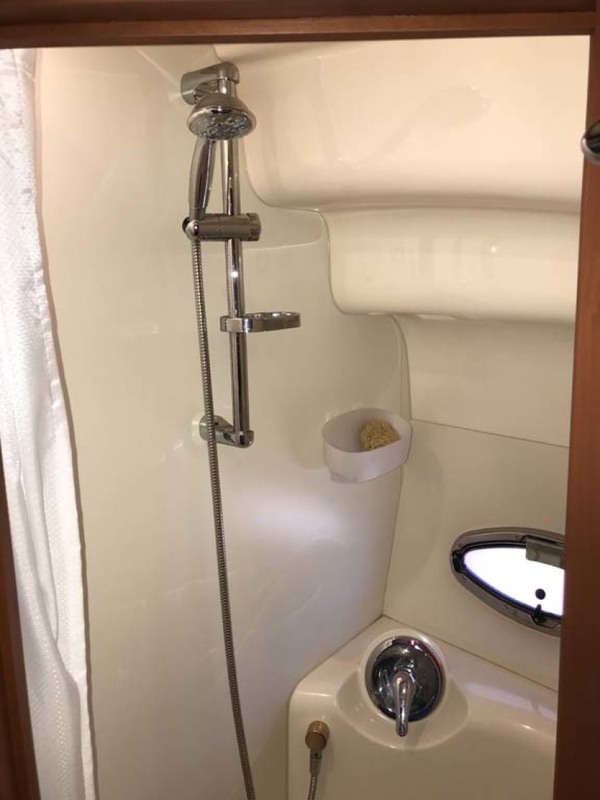 Aft to starboard is a sunken guest stateroom with twin berths that easily convert to a queen berth, good drawer and locker storage and opening portlight. 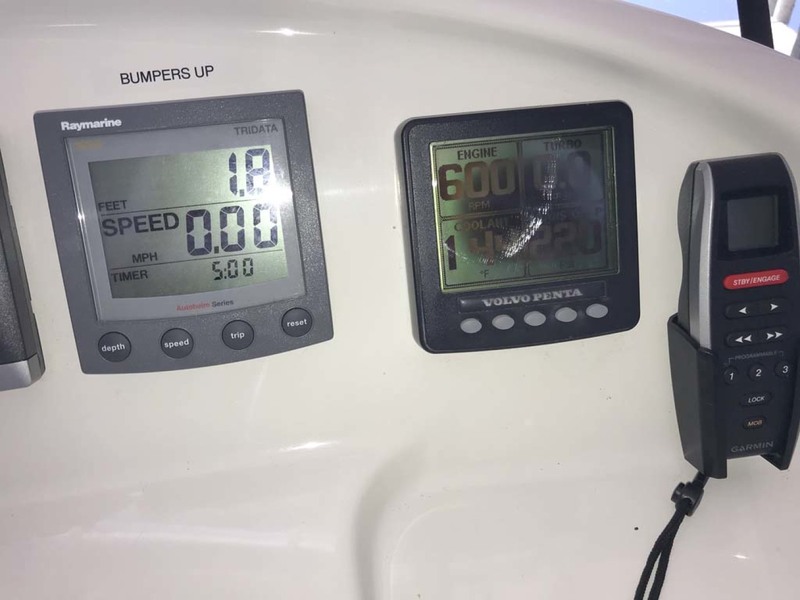 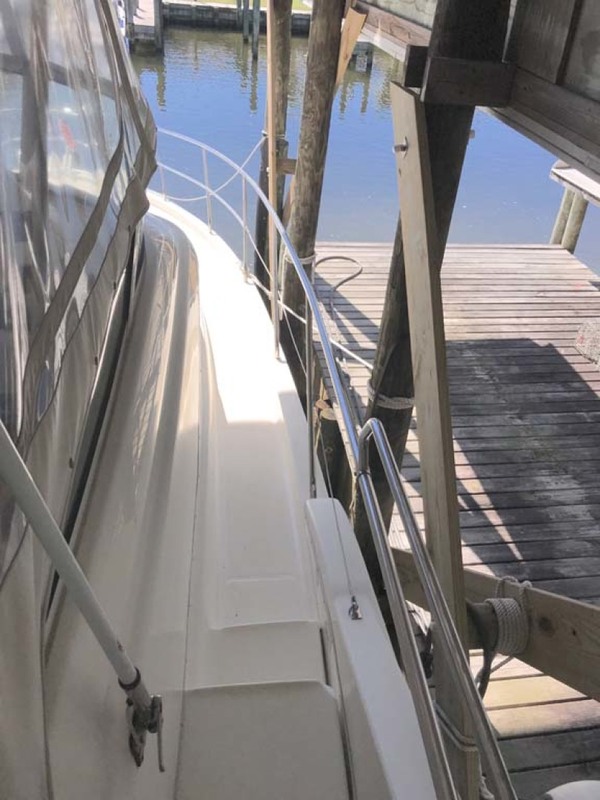 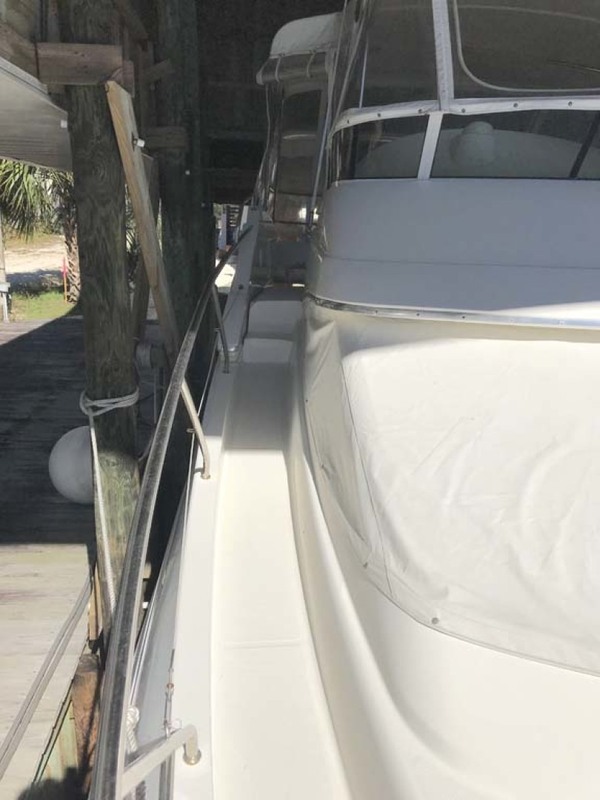 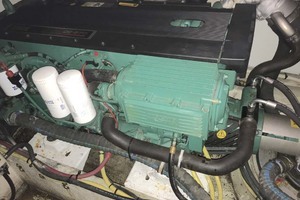 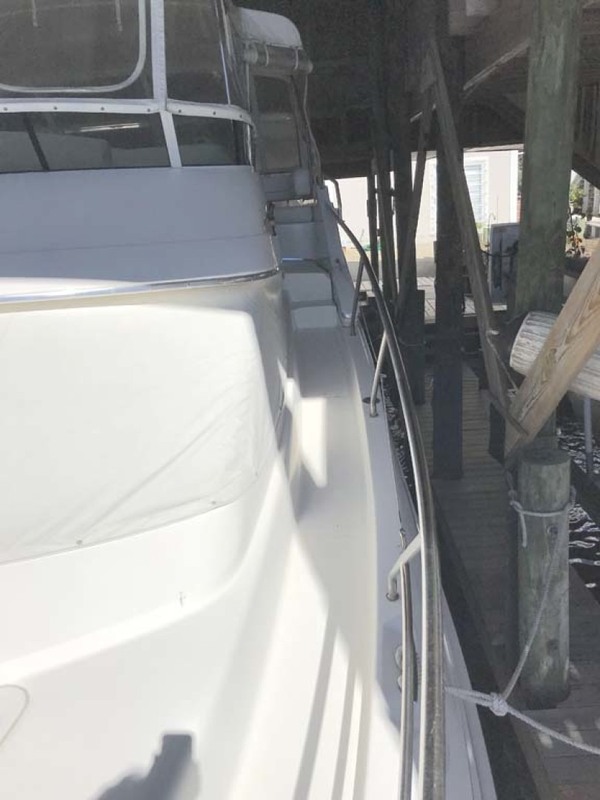 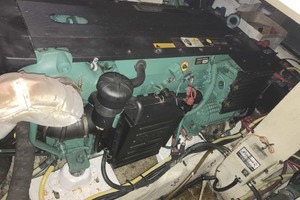 This flybridge covers nearly half of the boat's overall length. 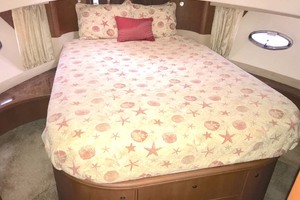 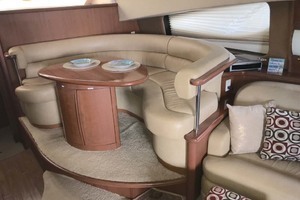 Included is an L-Shaped settee large enough for 8 adults plus 2 bucket seats at the helm and lounger to port. 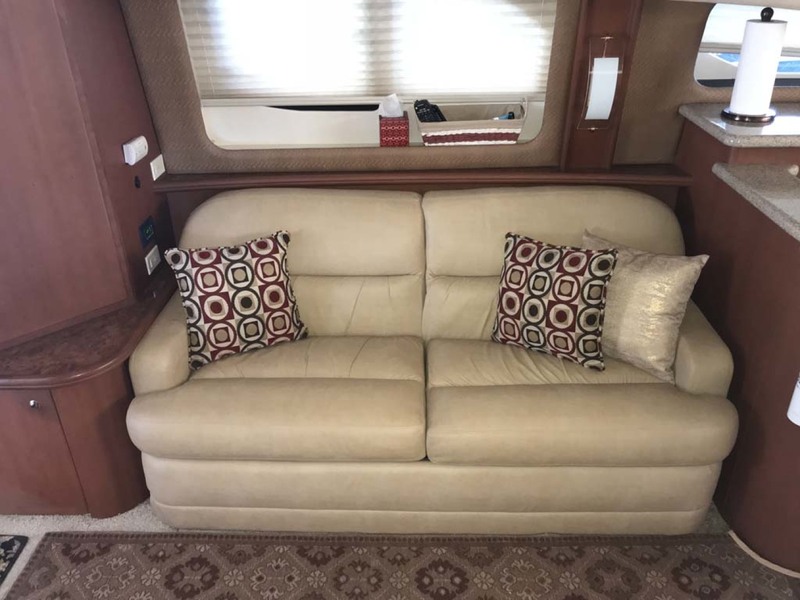 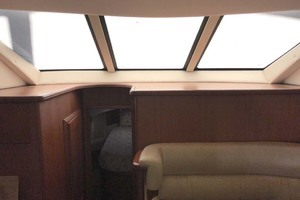 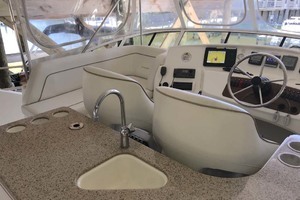 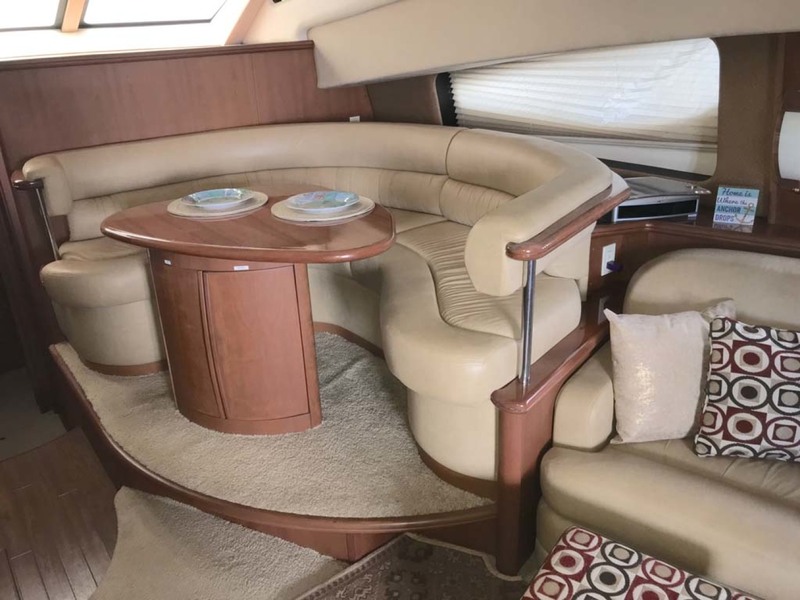 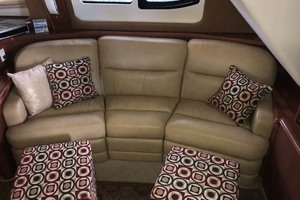 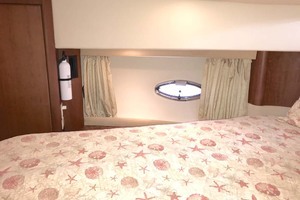 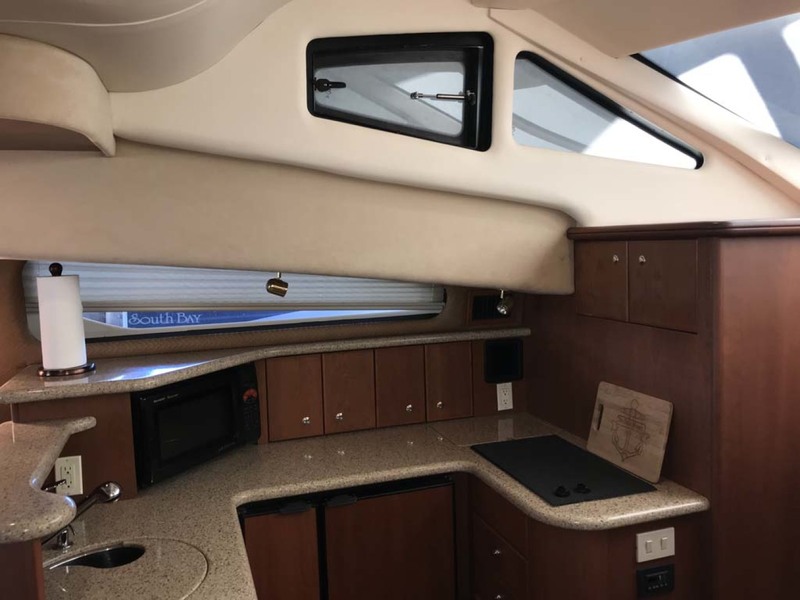 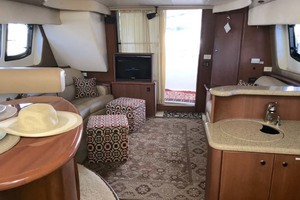 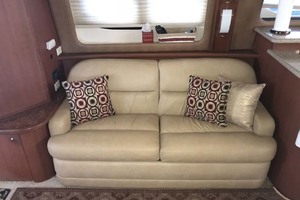 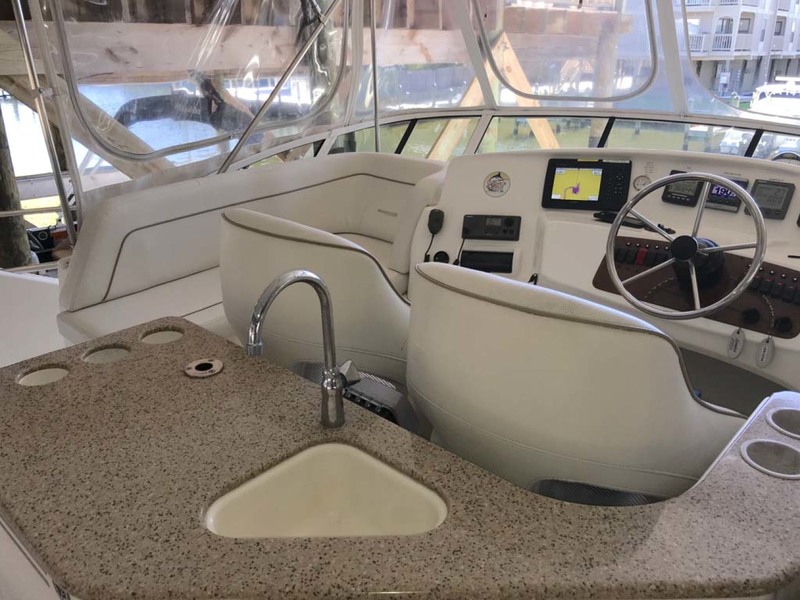 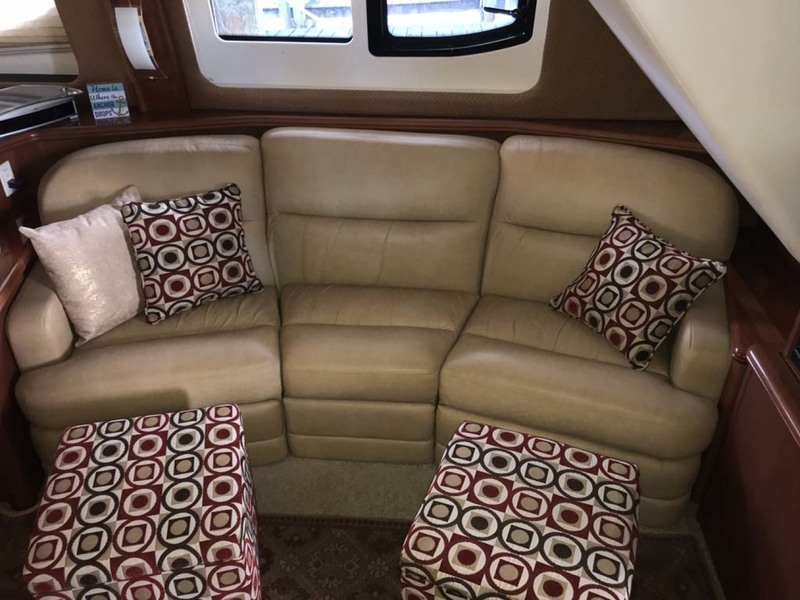 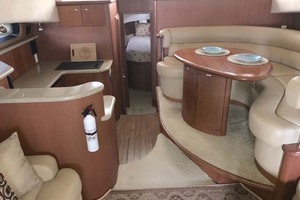 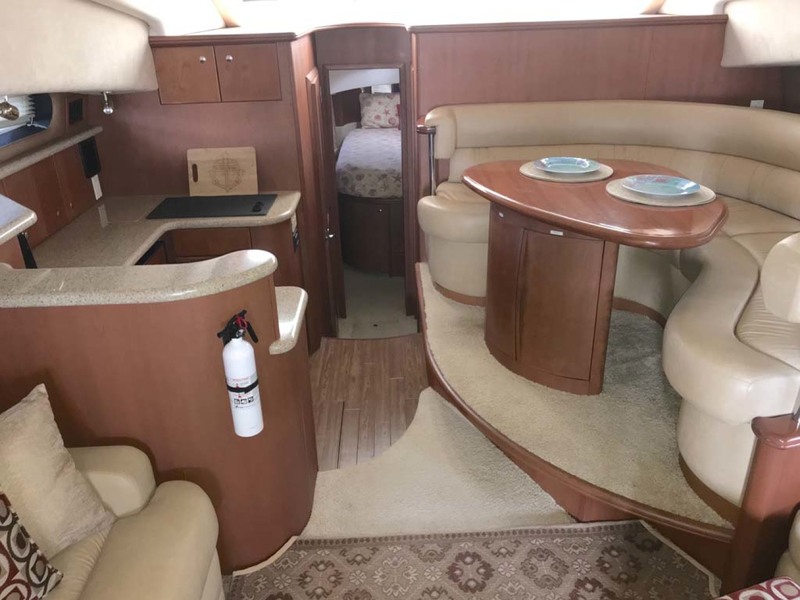 Facing the settee (just aft of the helm seats) is a wet bar with countertop just right for preparing beverages or serving snacks. 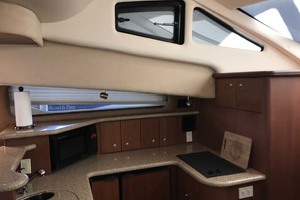 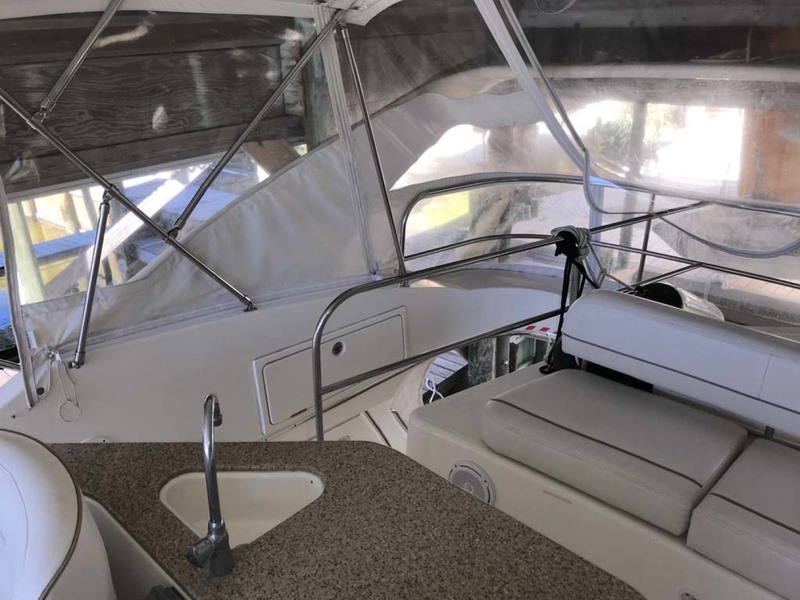 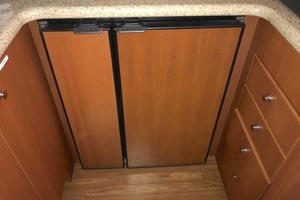 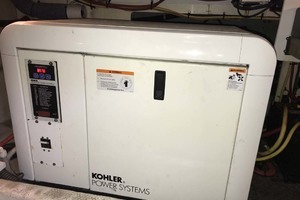 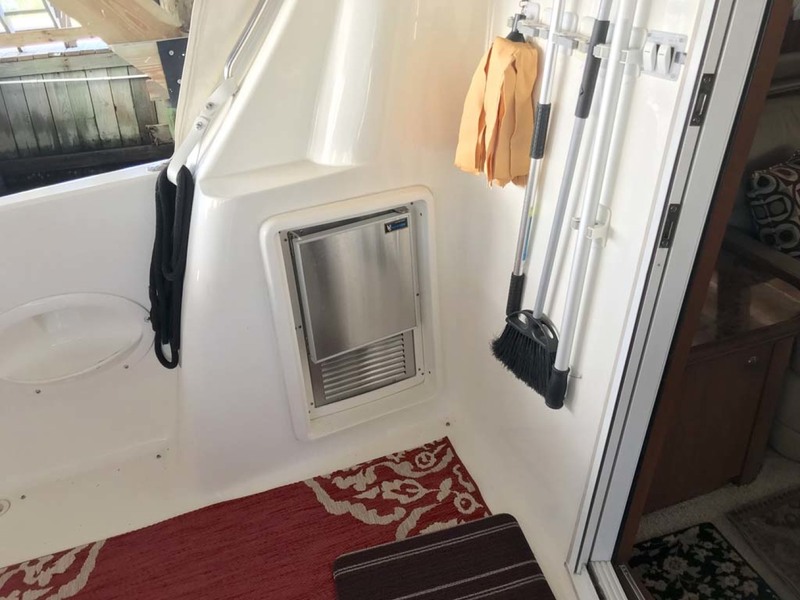 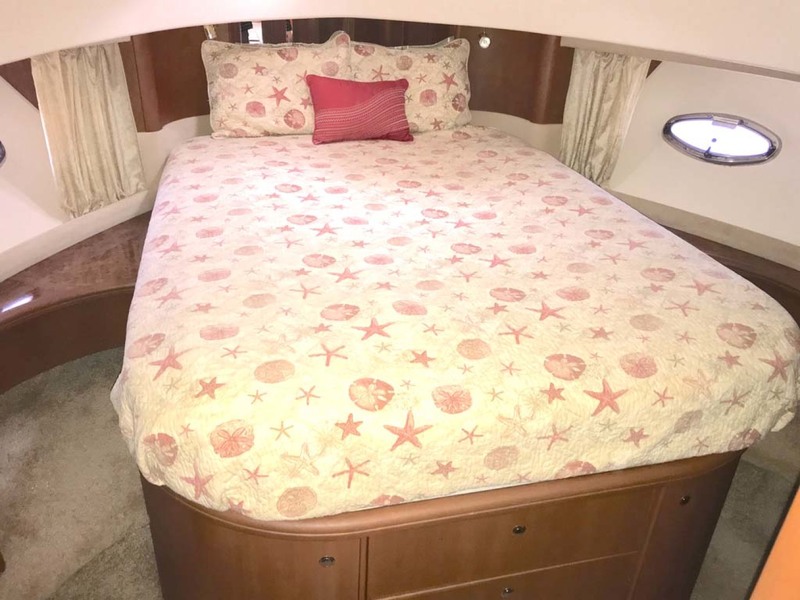 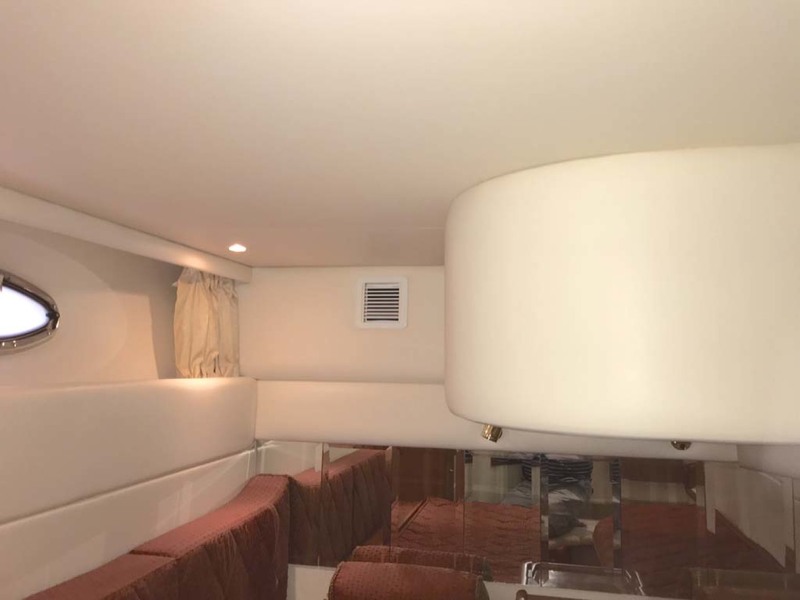 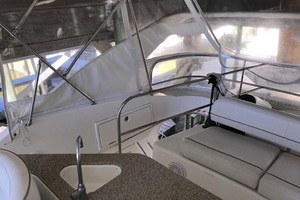 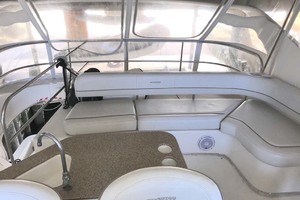 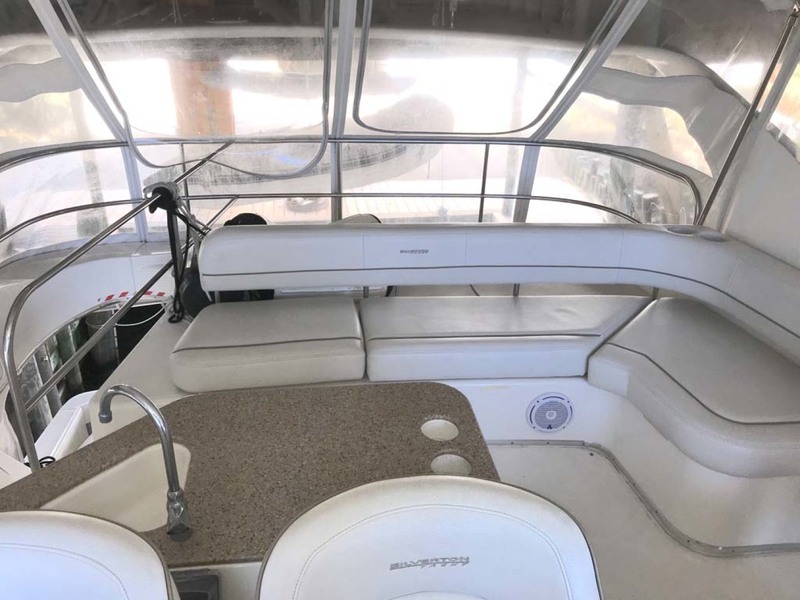 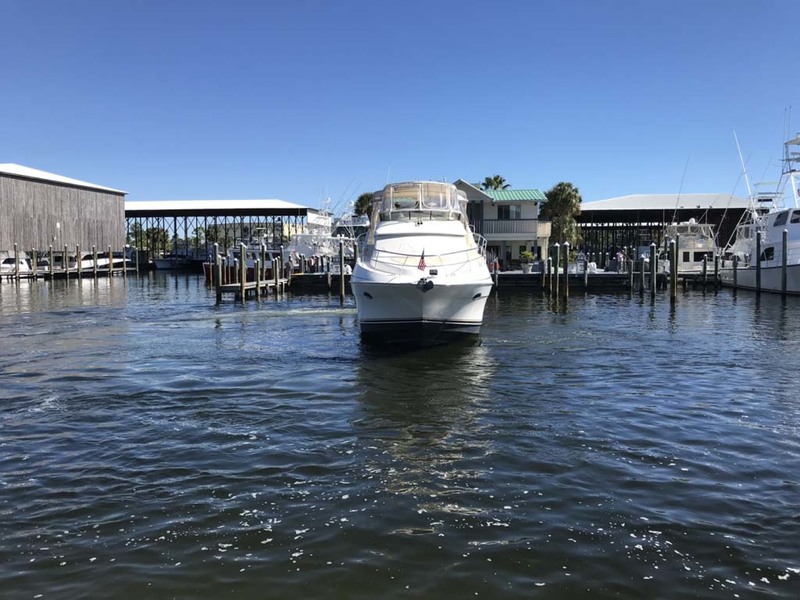 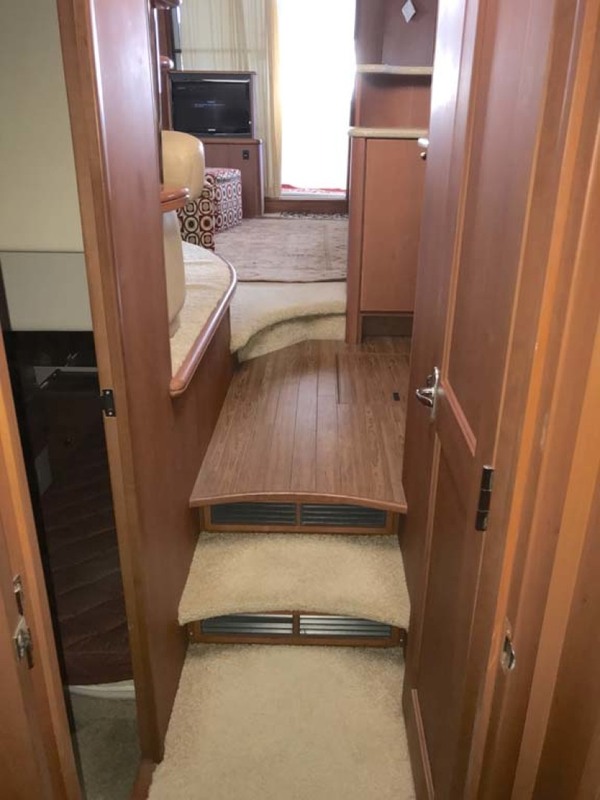 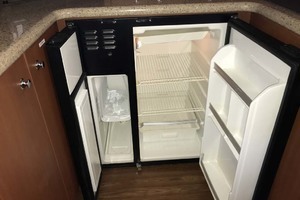 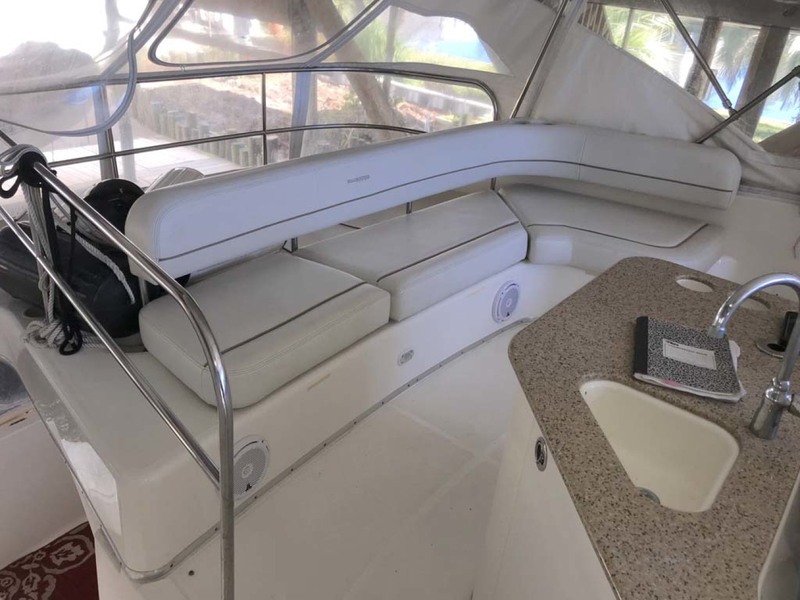 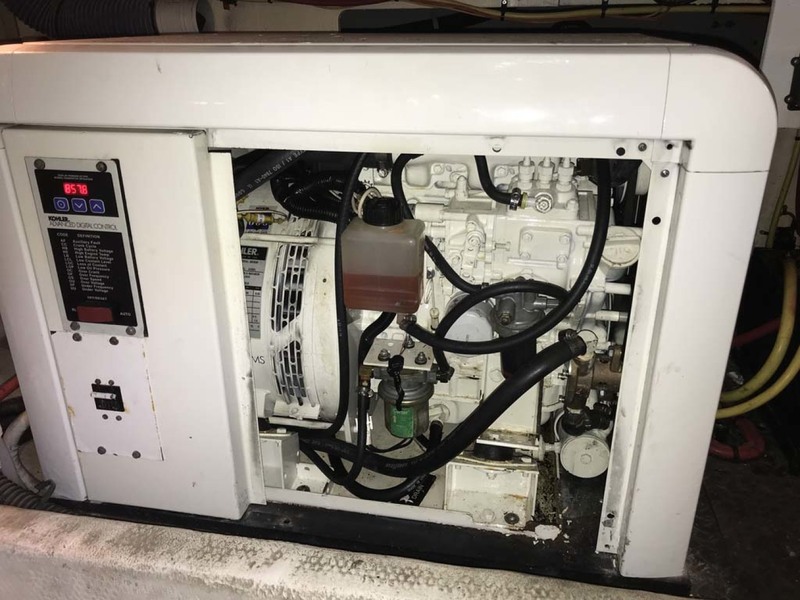 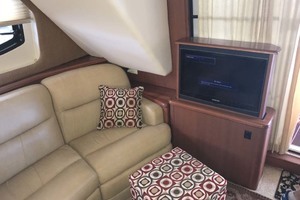 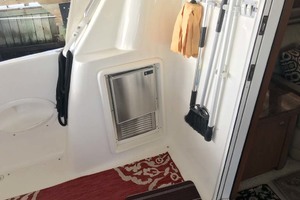 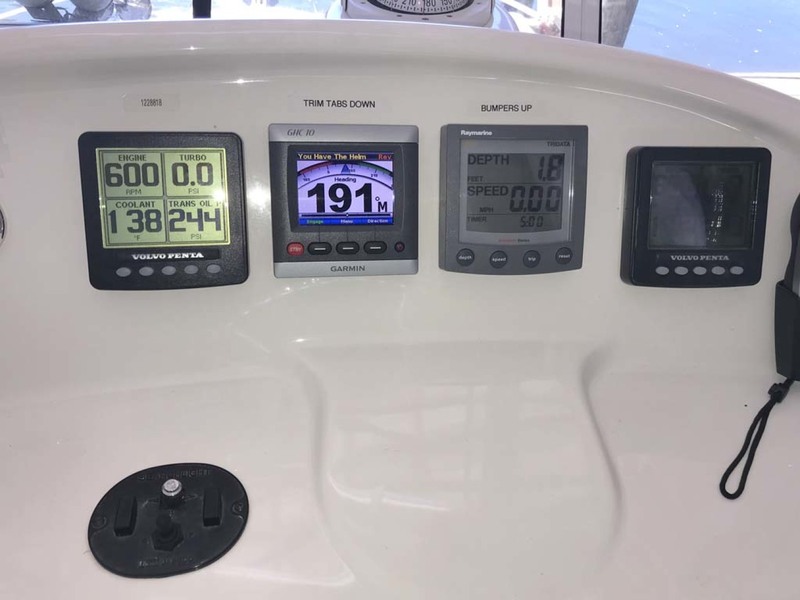 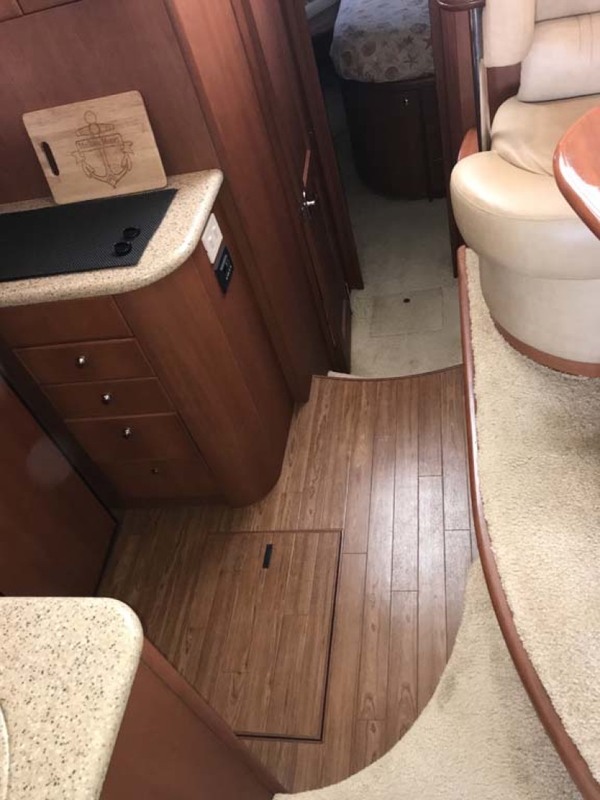 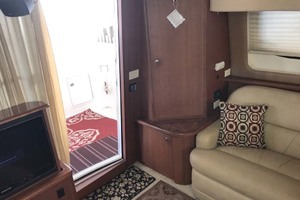 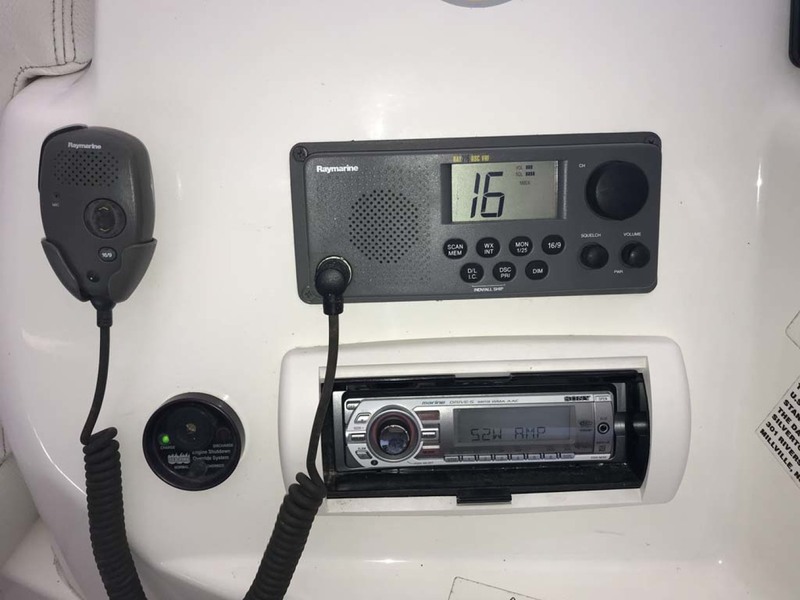 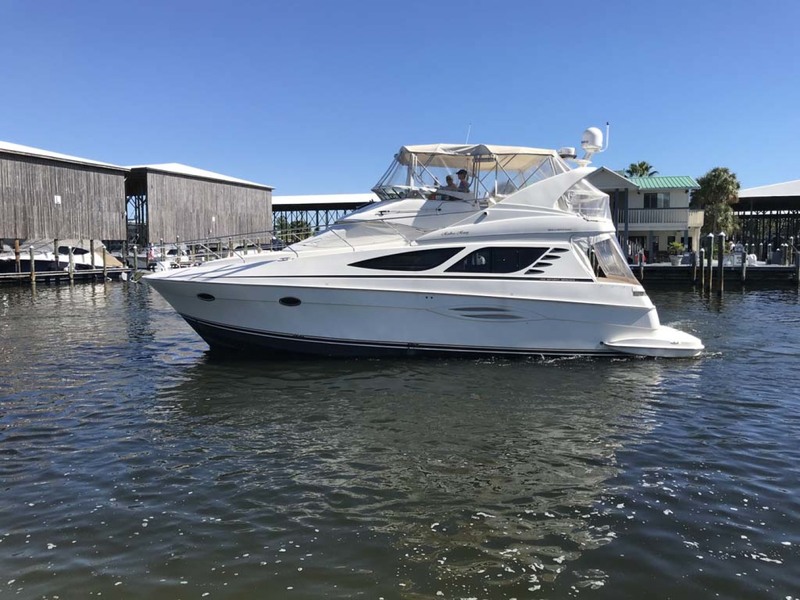 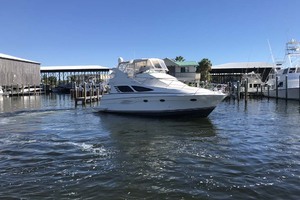 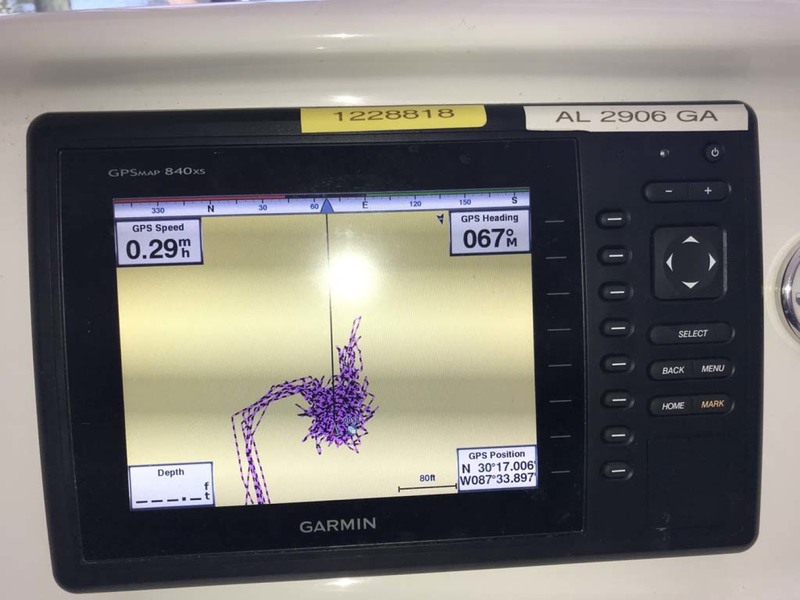 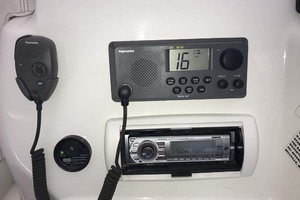 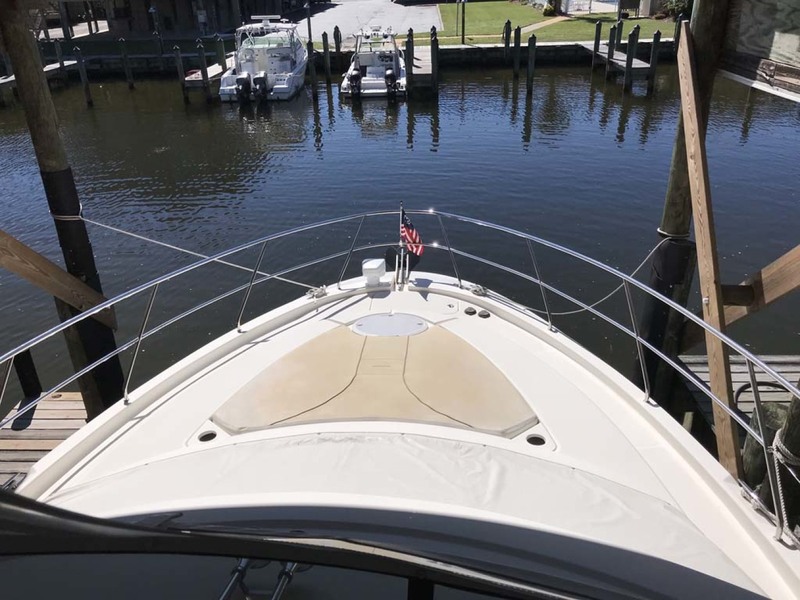 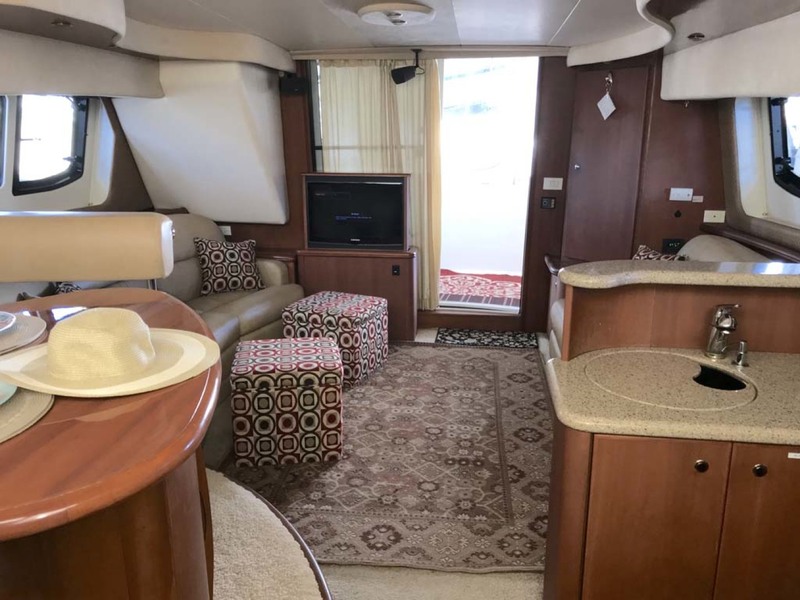 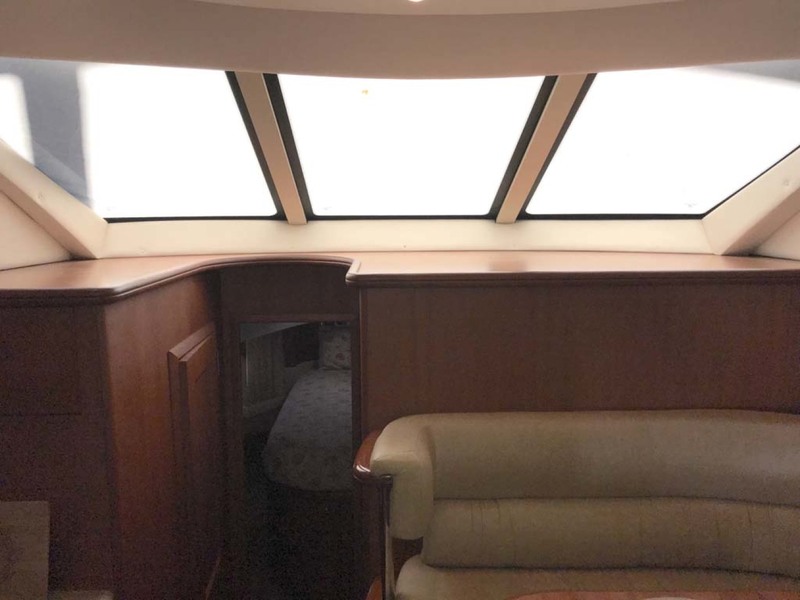 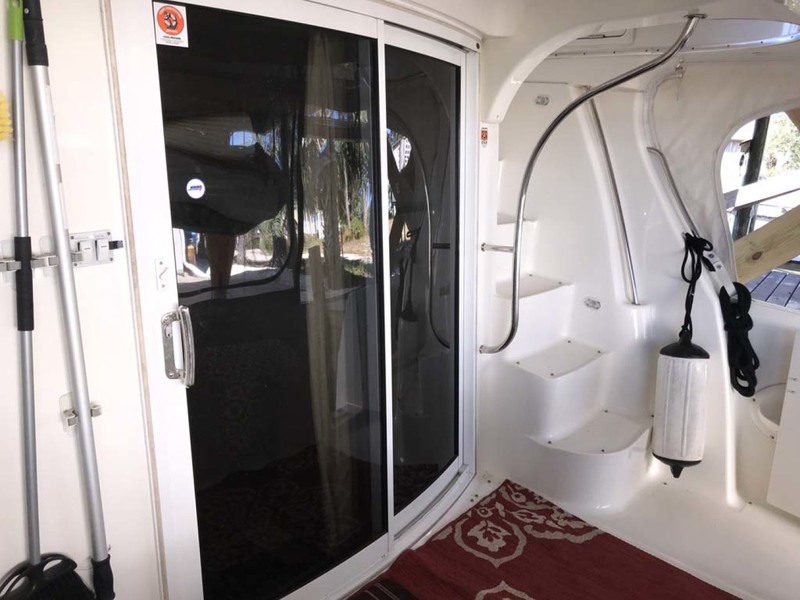 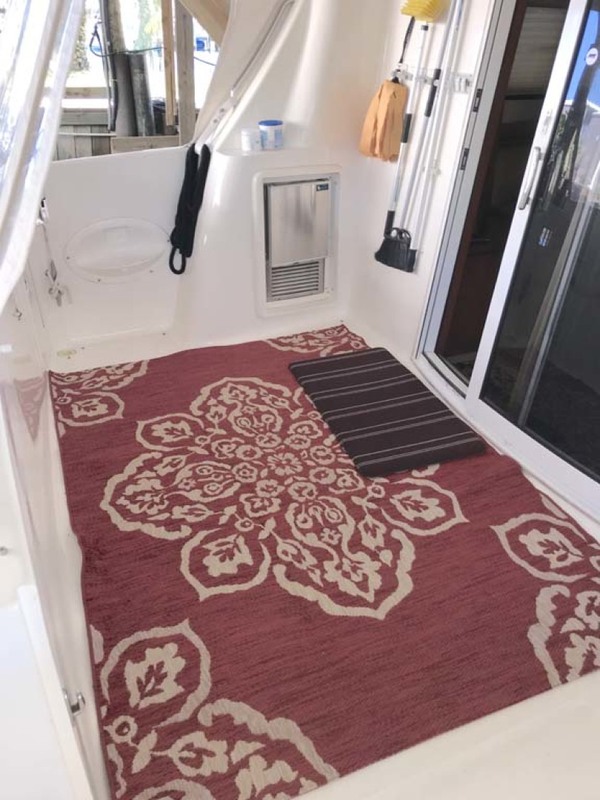 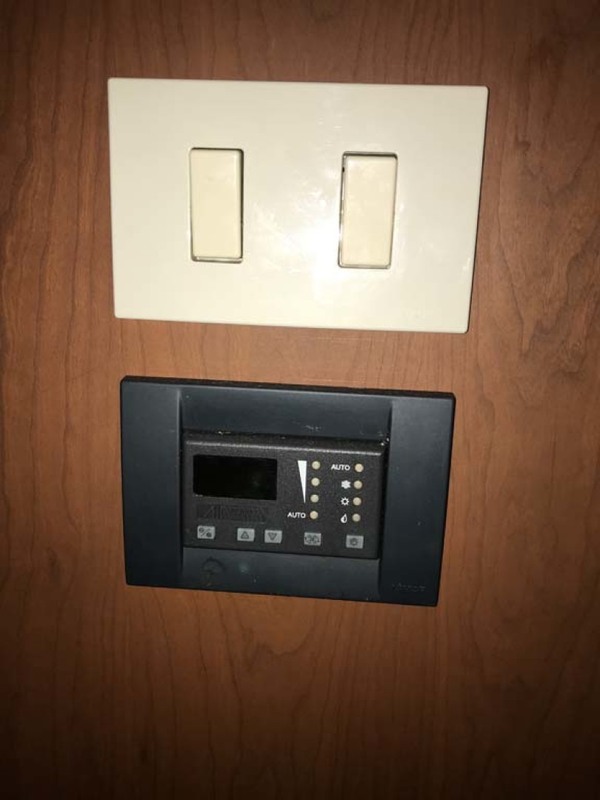 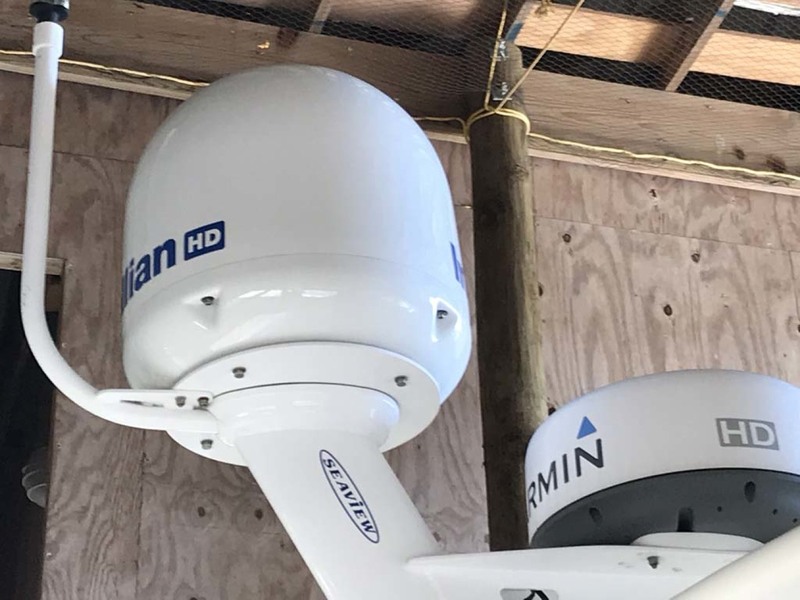 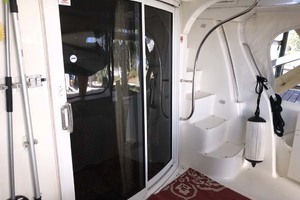 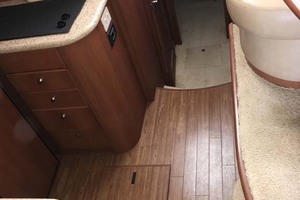 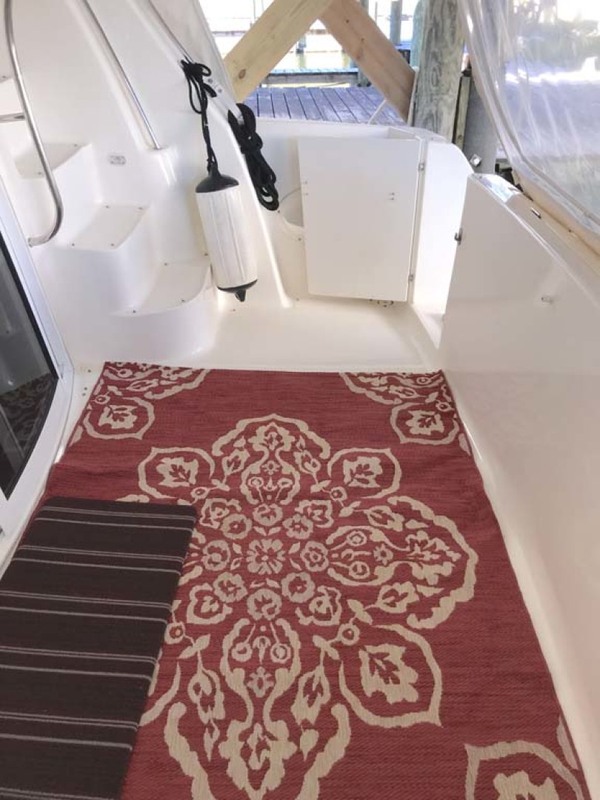 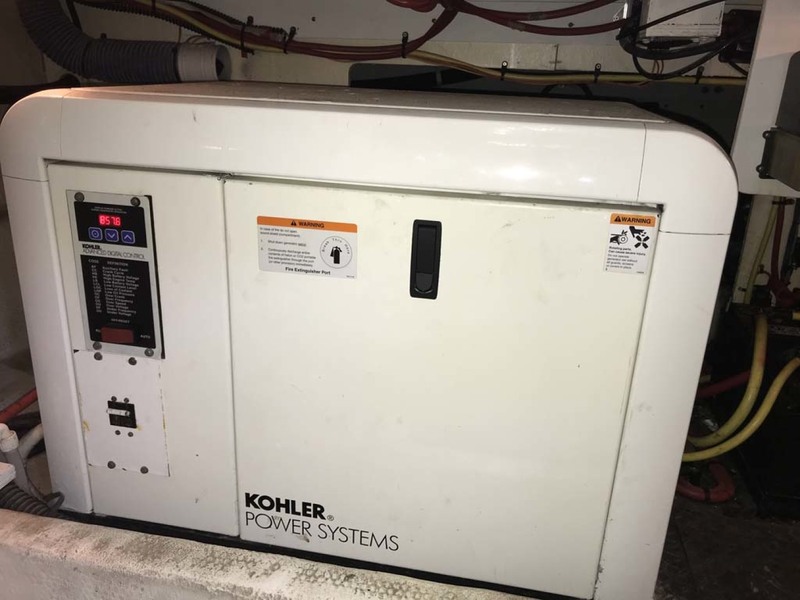 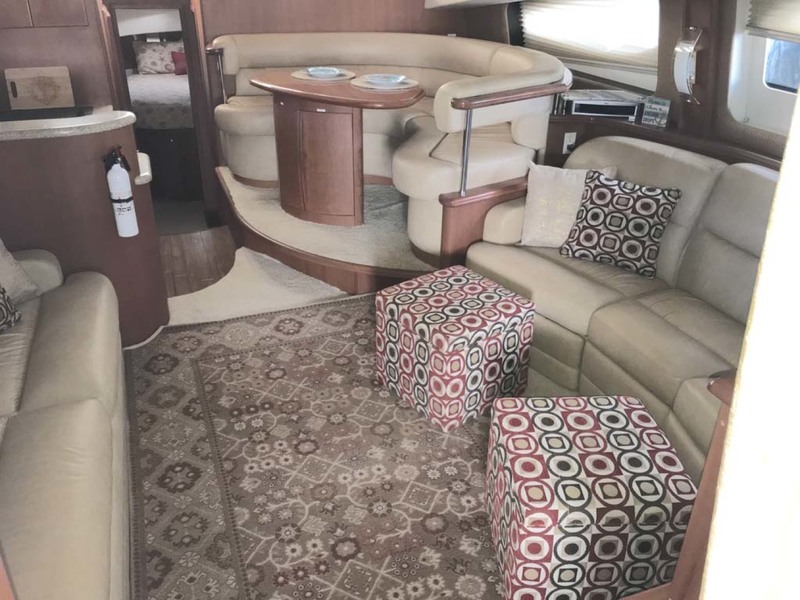 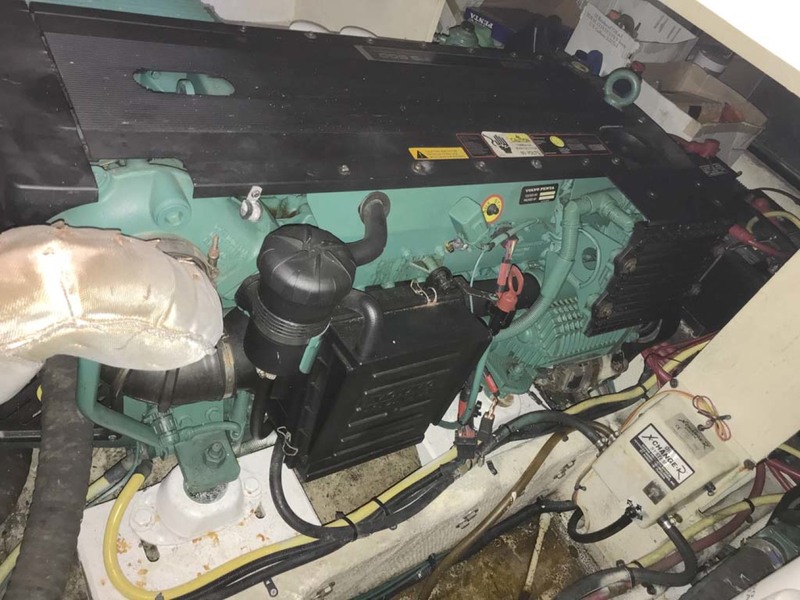 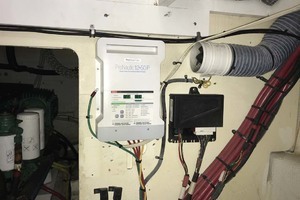 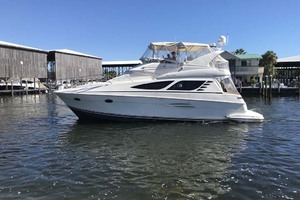 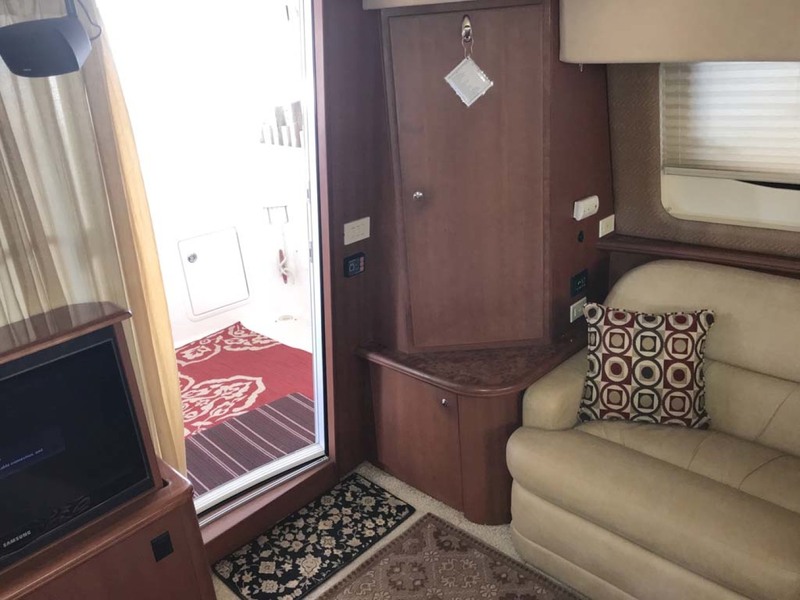 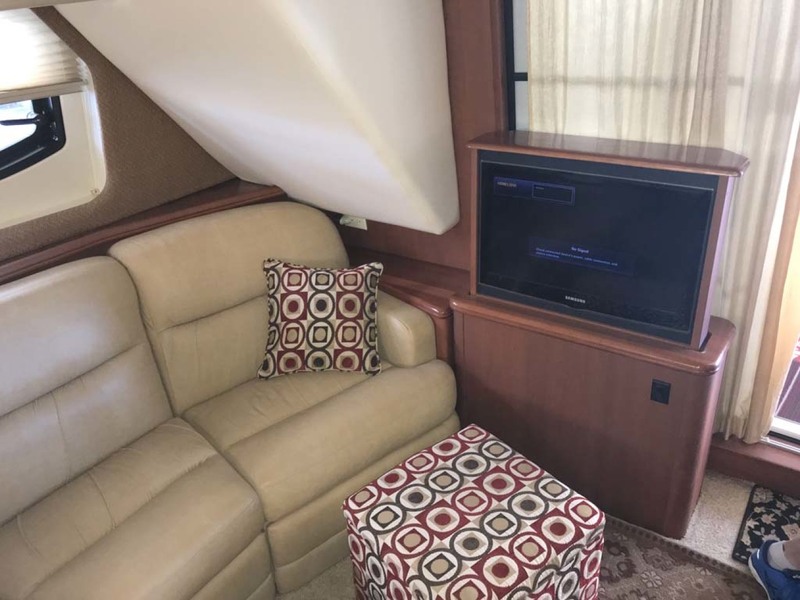 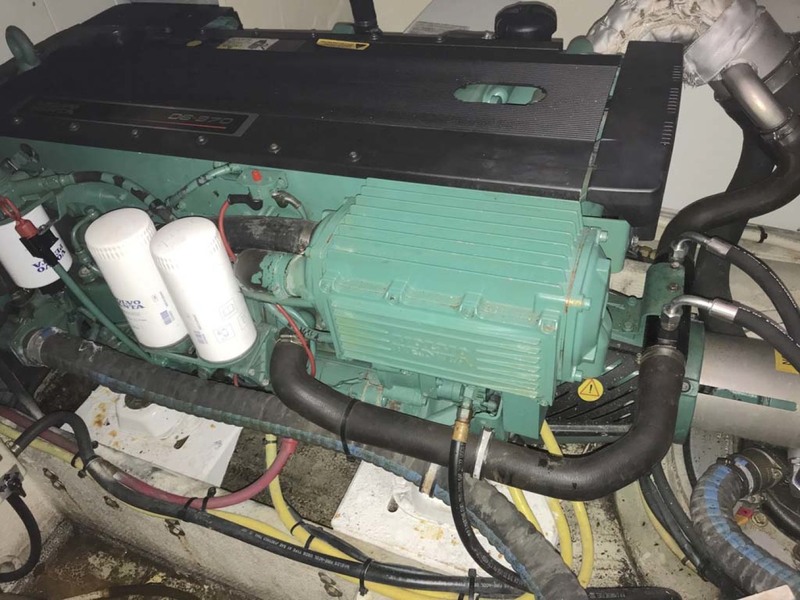 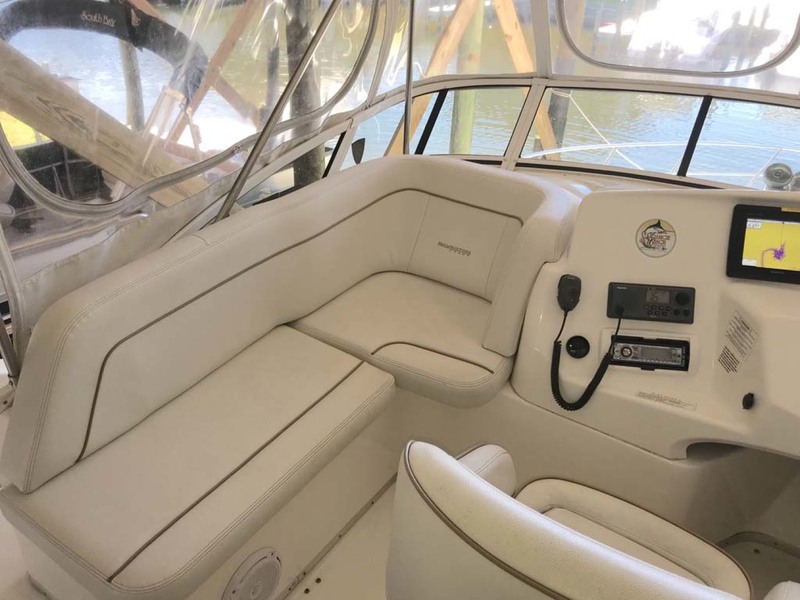 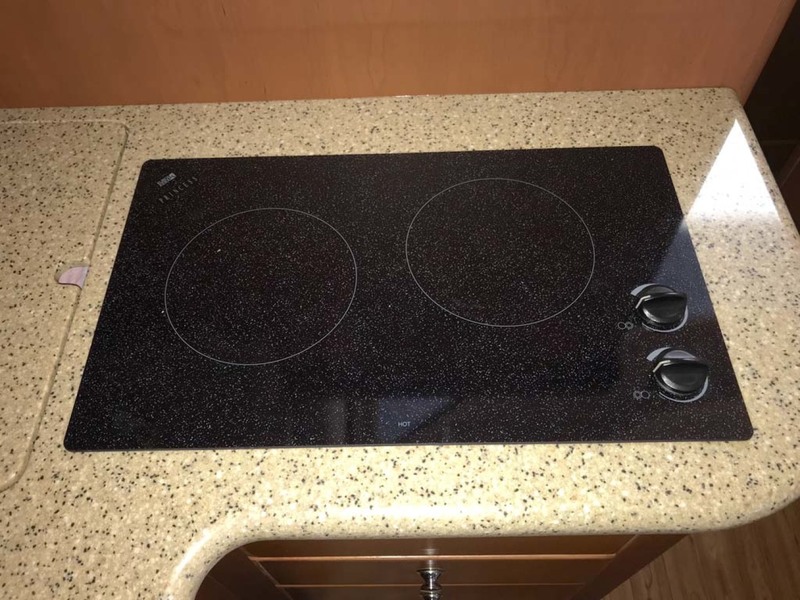 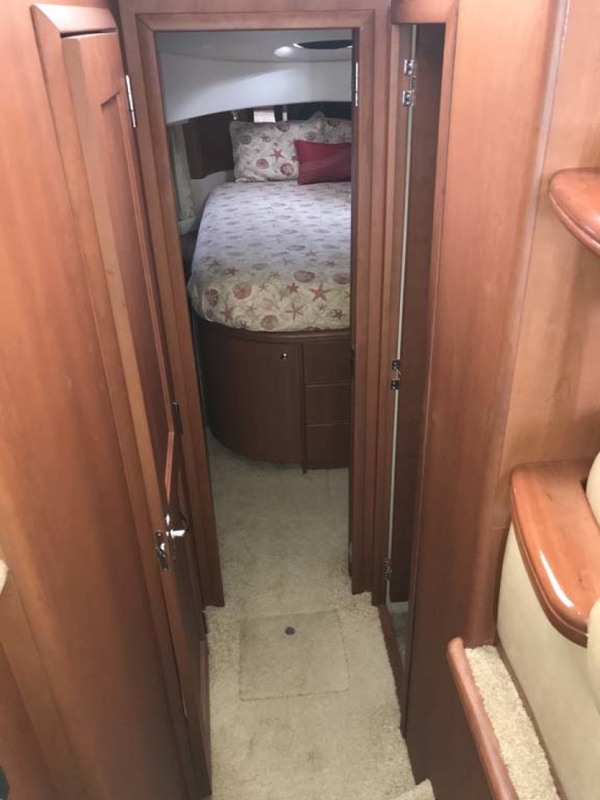 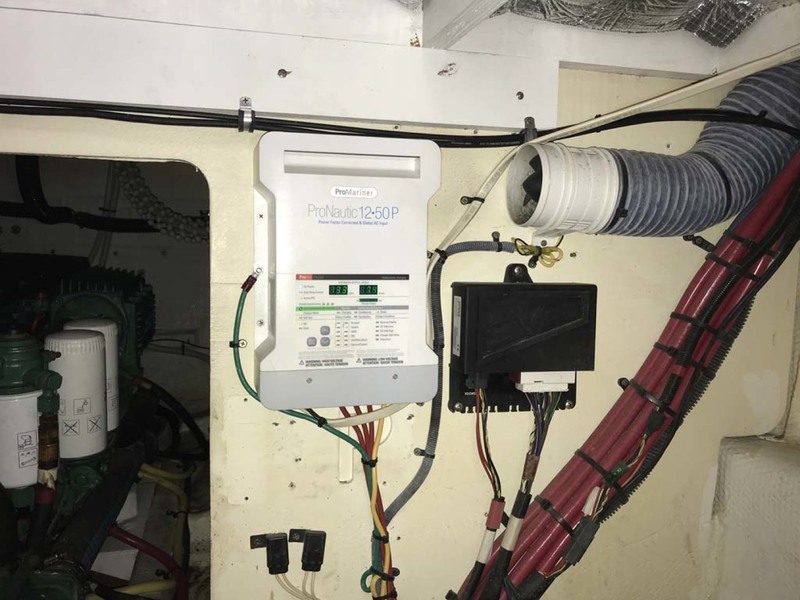 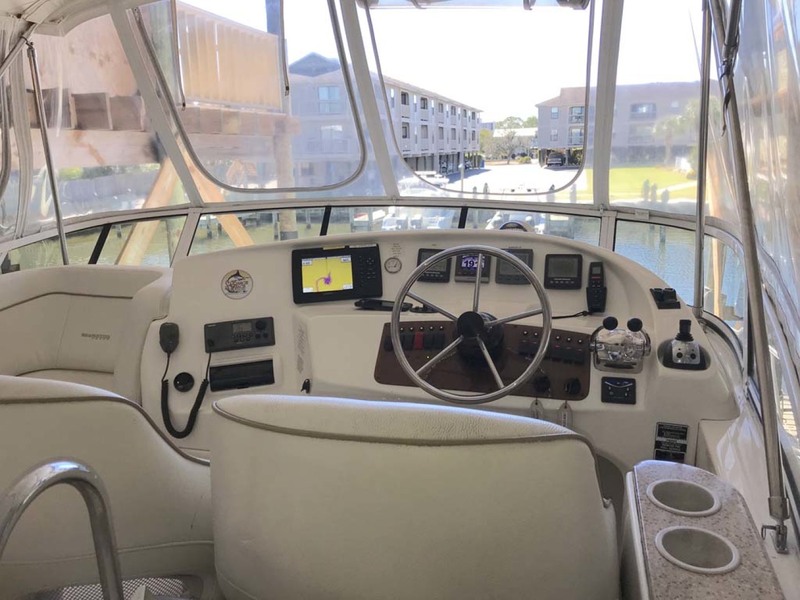 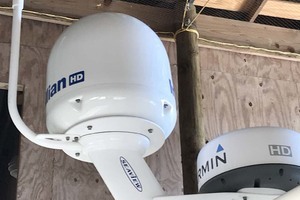 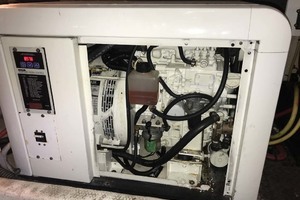 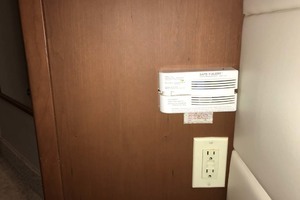 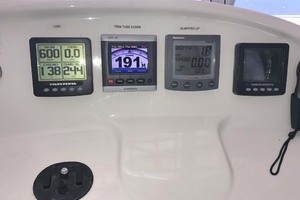 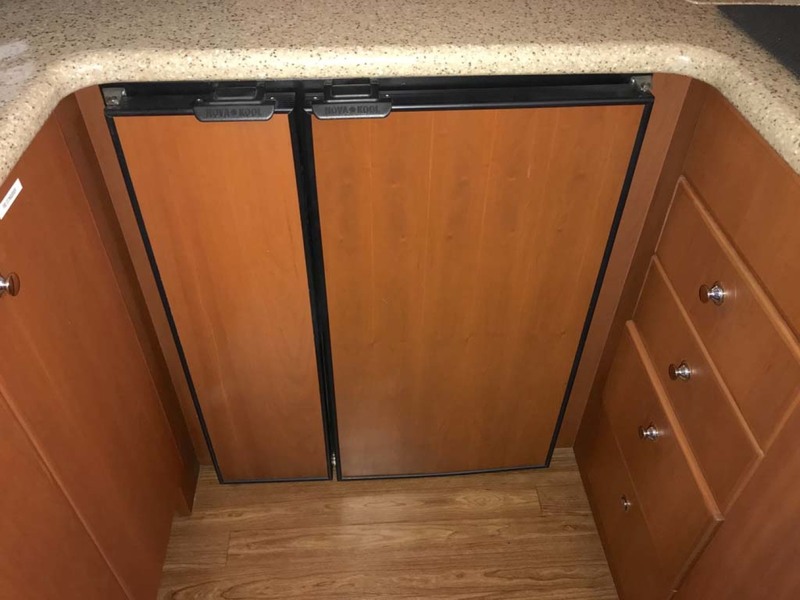 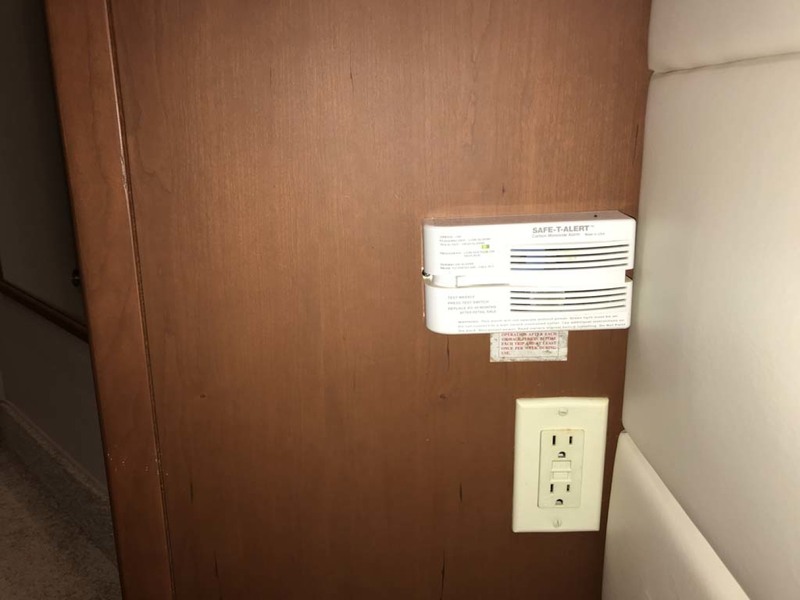 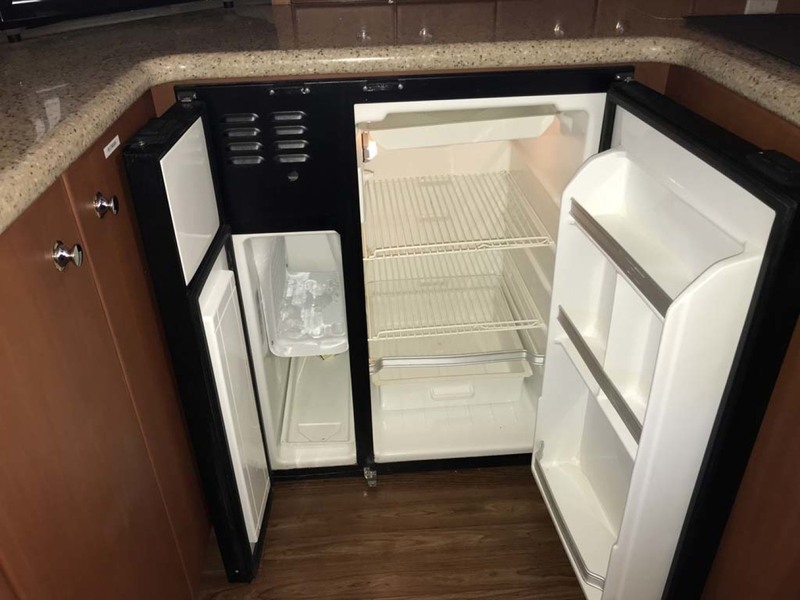 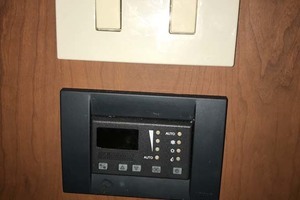 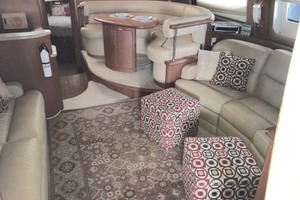 Included on the bridge is a Norcold refrigerator with freezer, Raritan ice maker, central vacuum system, Samsung 26” Flat Screen with TruSurround Audio and HDMI - USB ports, and full zippered bridge enclosure with canvas bimini-top. 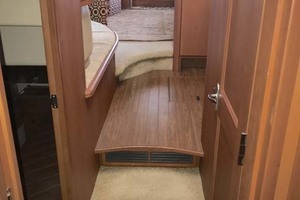 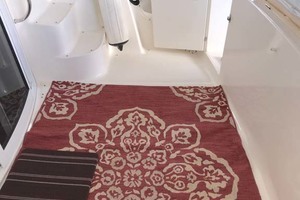 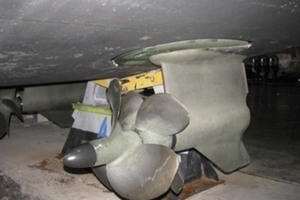 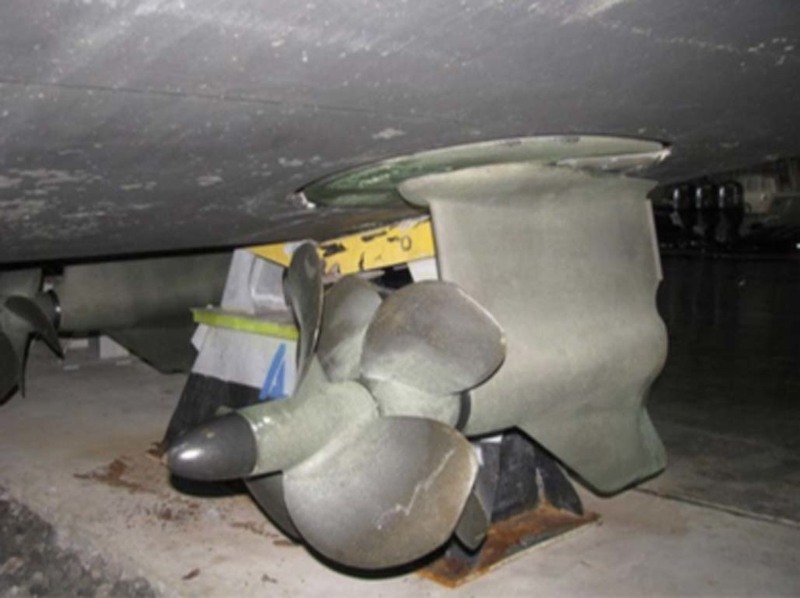 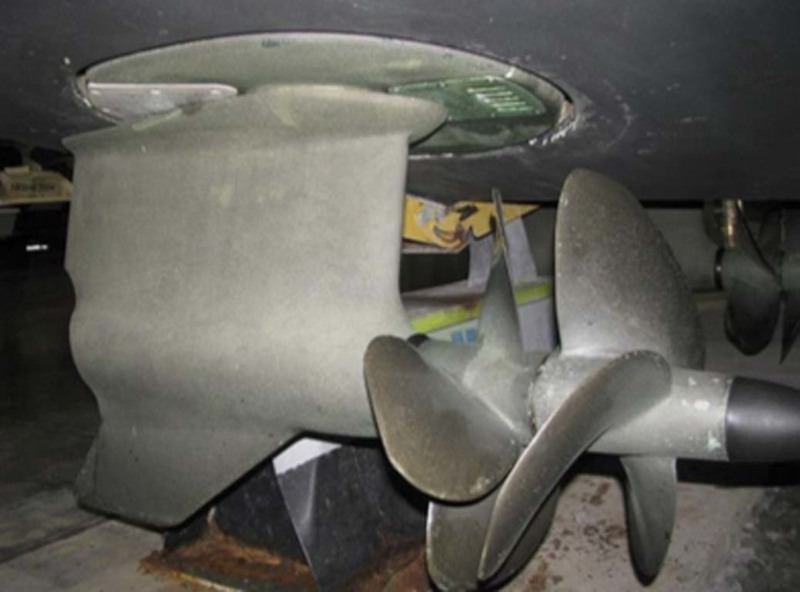 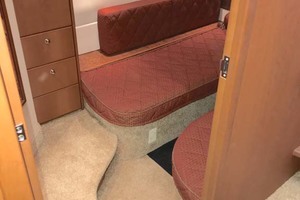 There is also a sun pad located aft just behind the seating area and another on the foredeck easily reached via Silverton's trademark SideWalk on either side. 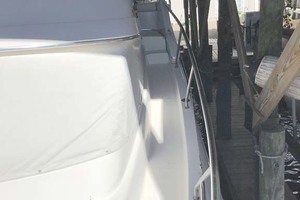 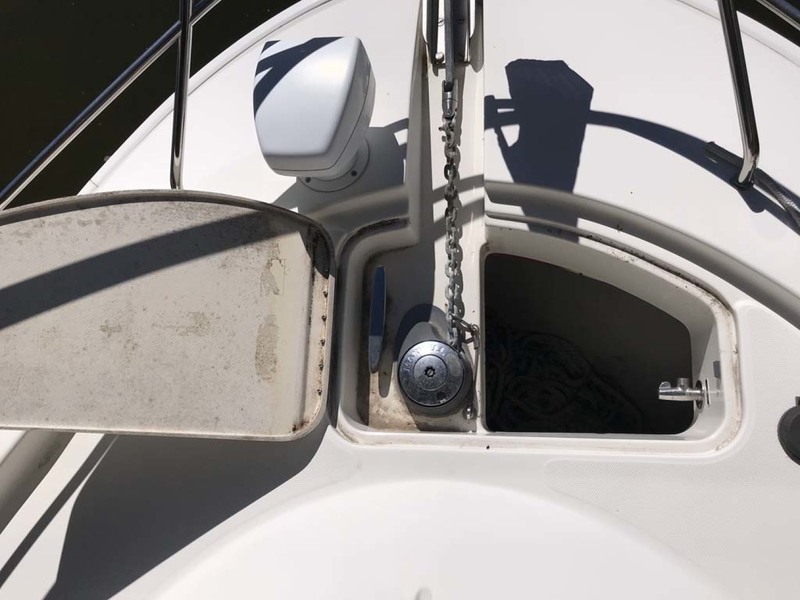 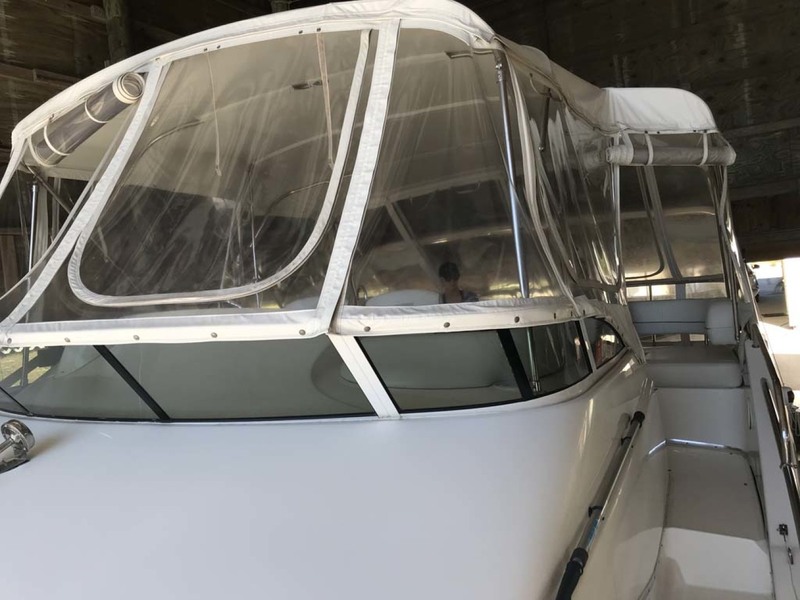 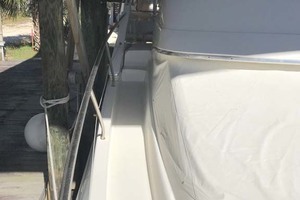 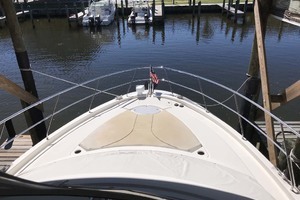 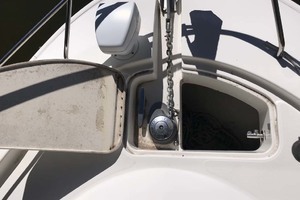 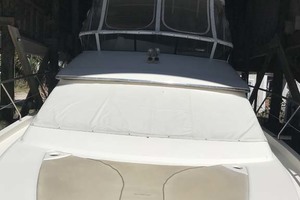 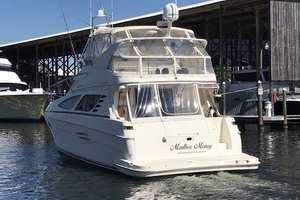 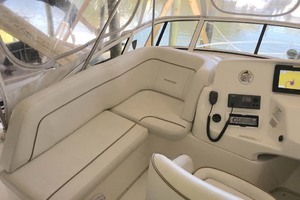 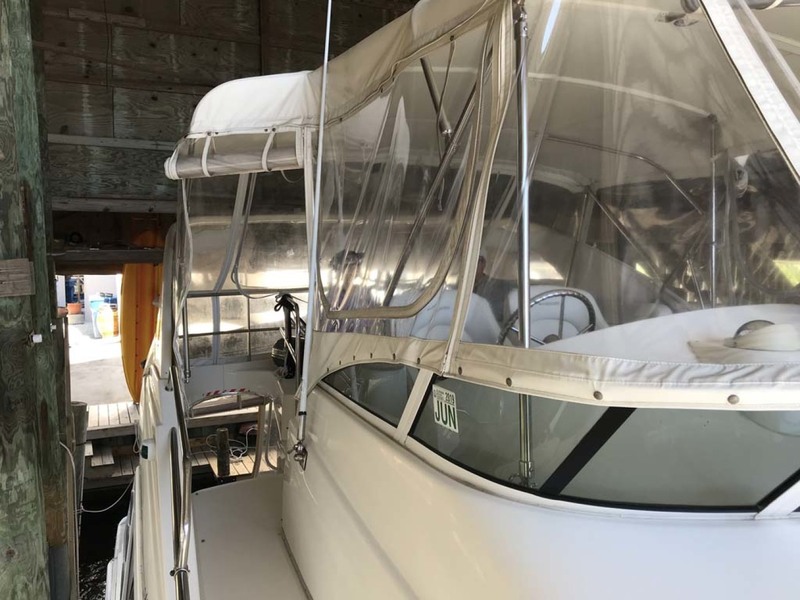 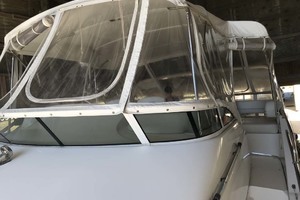 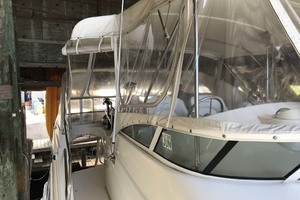 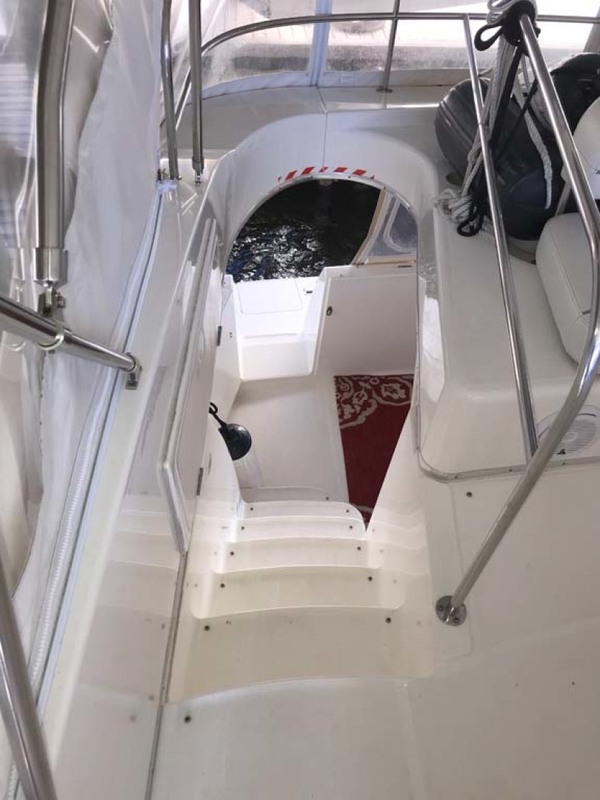 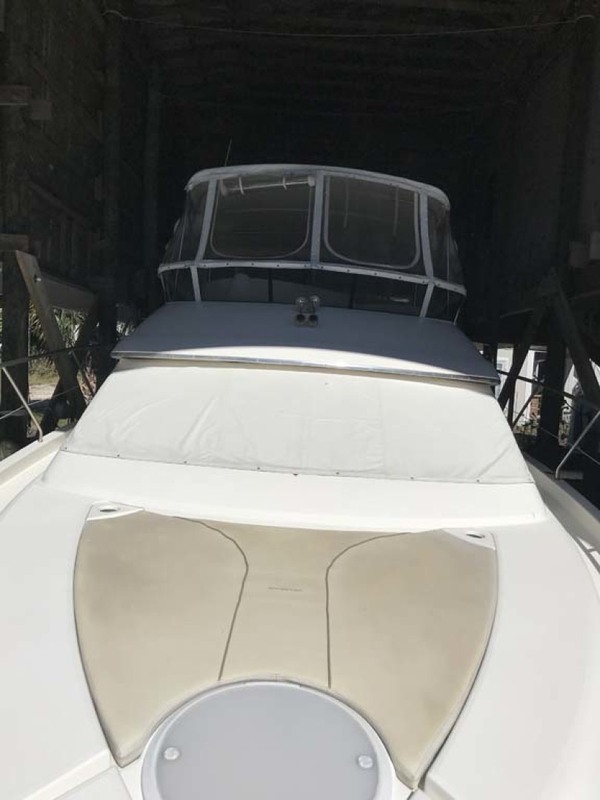 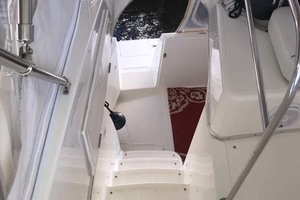 The extended length of the flybridge provides complete cover to the cockpit making it a shaded respite on a hot, sunny day or a shelter from stormy weather.